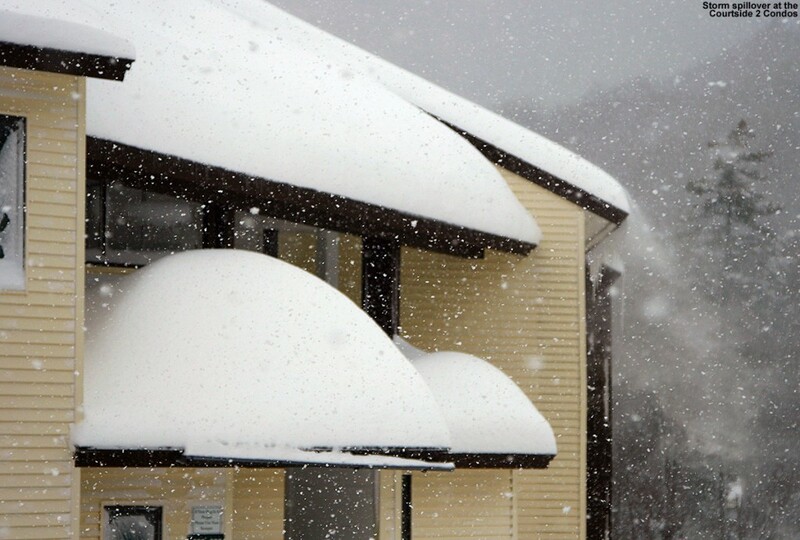 Our biggest storm cycle of the season to date finished up last night, with snow totals in the Northern Greens of 40” at Jay Peak, 36” at Stowe and Smuggler’s Notch, and 24” at Bolton Valley. With additional snowfall from the two preceding storms of close to a foot, that put Jay Peak at over 50” of snow for the past few days, with the other mountains falling in line accordingly. Large storms are often great at enhancing the ski conditions, but this storm was especially beneficial with the low snowfall and snowpack we’ve been dealing with so far this season; we hadn’t had a single one of these multi-foot storm cycles, and there’s no better way to catch up on the low season snowfall than getting those big mountain storms. 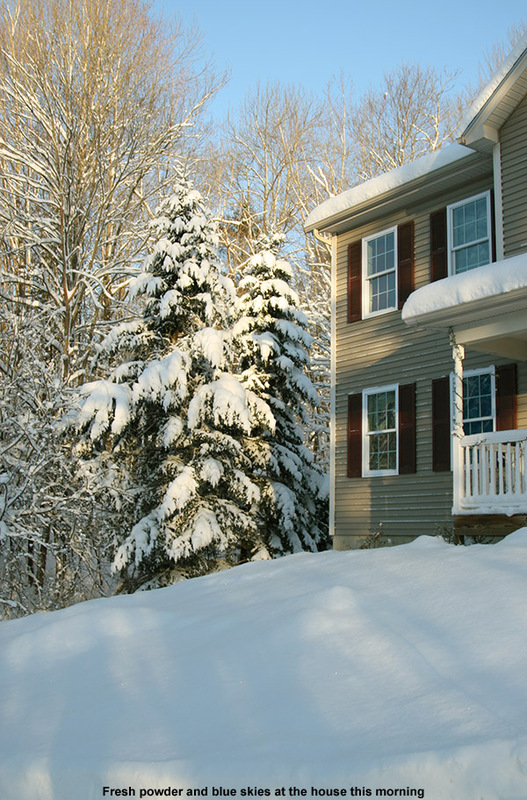 Even down at the house, we picked up close to two feet of snow from the storm; it was by far our largest snowfall of the season in the valley, and it pushed the total season snowfall to just shy of the 100” mark. 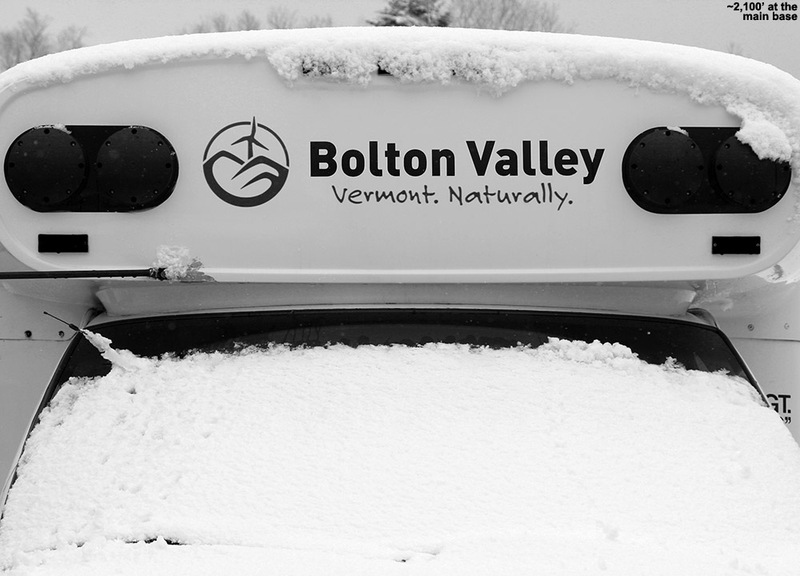 Yesterday we headed up to Bolton Valley during the meat of the storm, with snow falling at rates of 1-3”/hr. We didn’t do a tremendous amount of skiing since all the major lifts were on wind hold, but we did get in some fun powder turns off the Mid Mountain Lift, and got to be out in the storm while it buried the resort. 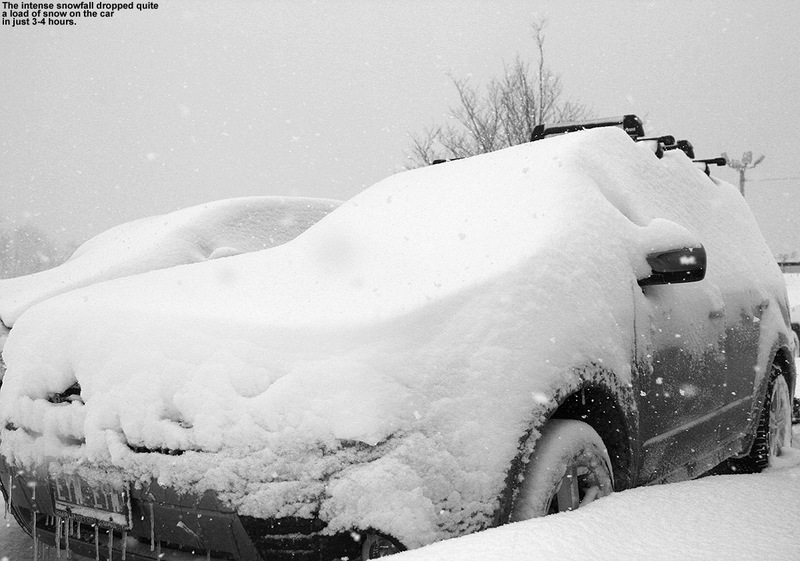 The snowfall had continued until around midnight, but clearing skies quickly followed. 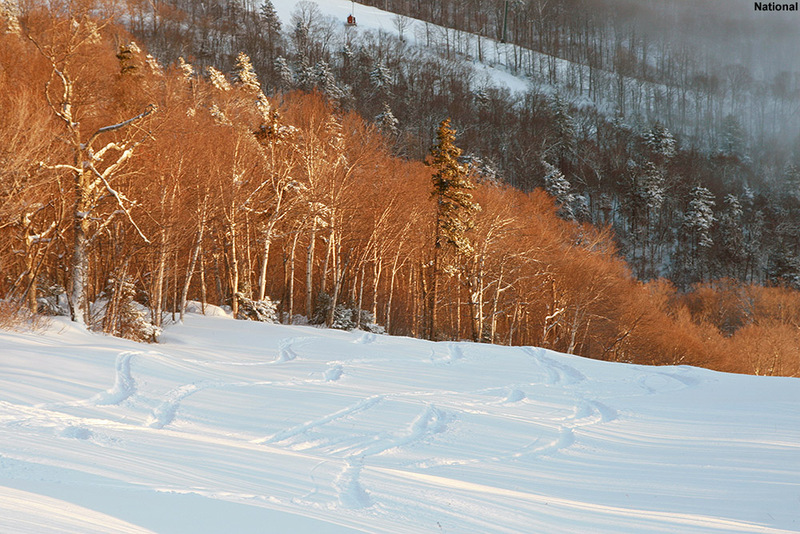 The sunshine this morning spoke of the crisp, clear weather that was forecast for today, and with three feet of new snow at Stowe, we headed off to the mountain fairly early to get the most of what were likely to be fantastic ski conditions. 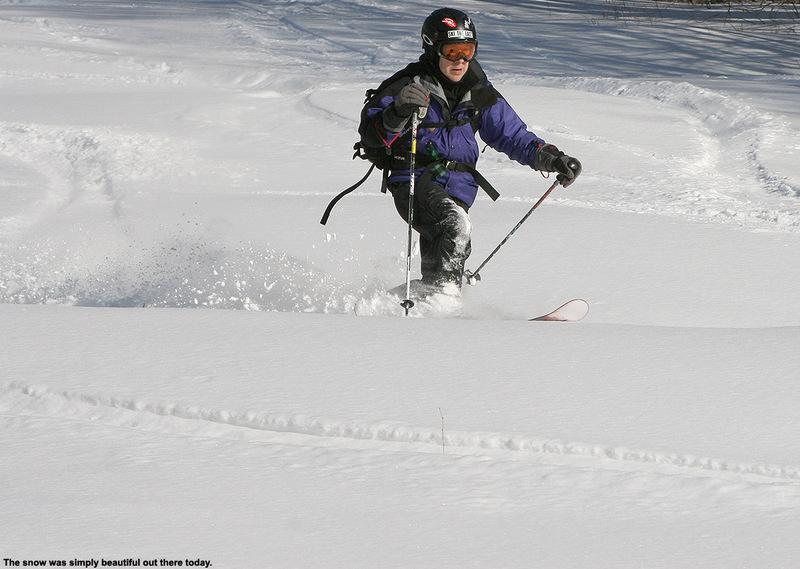 It was one of those days where choice of ski was easy… everybody went fat. 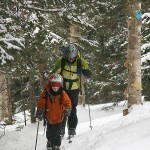 E and I even got off our Telemark skis and took the opportunity to pull out our alpine CMH fatties for the day. 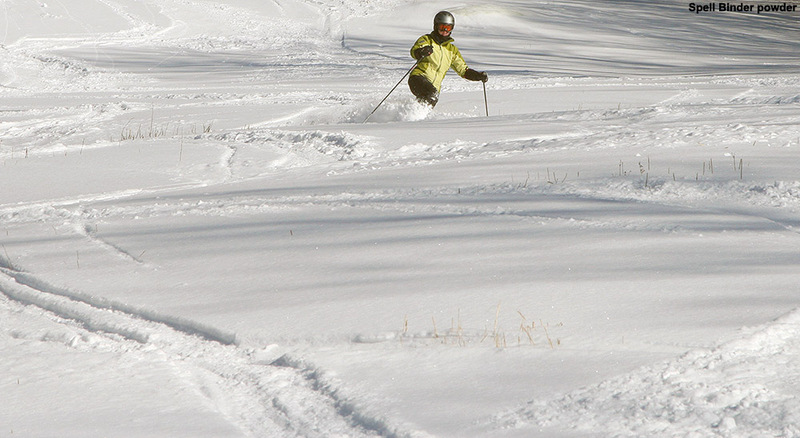 We arrived at Spruce Peak around 9:00 A.M., and could see that people were already laying down some tracks in the powder fields above Meadows. The snow looked absolutely glorious in the sun, and the temperatures were in the teens, so there certainly wasn’t going to be any melting. Since the open slopes above Meadows are some of our favorite runs, E and the boys and I hopped on the Sunny Spruce Quad and headed right that way. 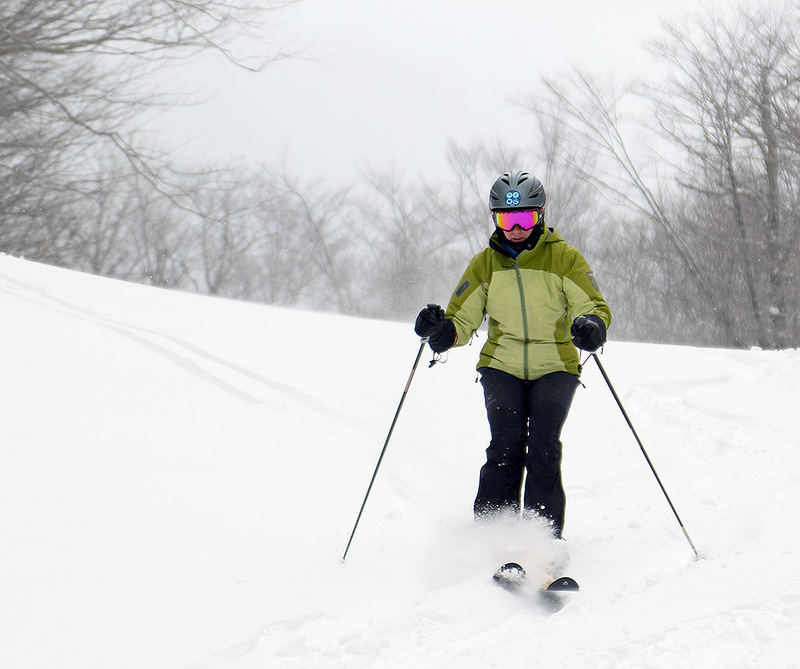 I skied down first to set up for some pictures, and found roughly two feet of dry, bottomless powder over a base of even more soft snow – it was just what one would expect to find after multiple feet of snowfall in the past few days. I’m sure the snow settled a little overnight, but my density analyses from yesterday at the house revealed six hour accumulations of 7.1 inches of 3.8% H2O snow during the day, followed up by 8.4 inches of 2.1% H2O snow during the evening. 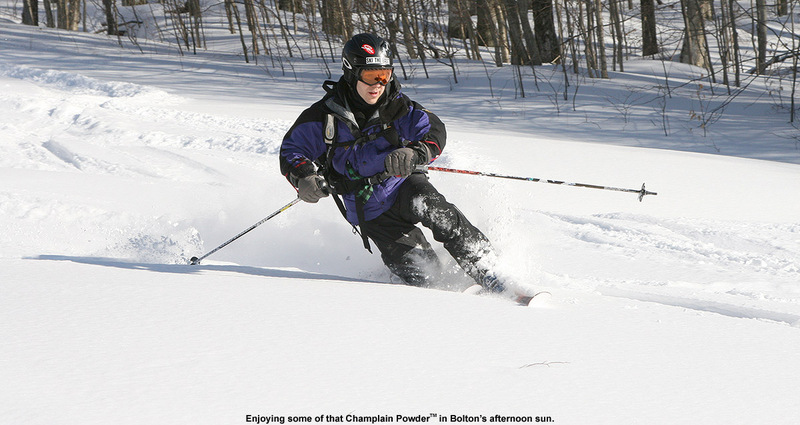 Simply put, that’s some serious world class powder for skiing, and coupled with the amounts that fell in the higher elevations, that’s some snow quality that is certainly well up there even in the realm of our local Champlain Powder™ standards. Once I pulled out the camera, E and the boys followed my lead with some awesome turns; there were some previous tracks on the slope, but it was pretty hard to make a bad choice of line. For our next round of turns we decided to check out the top of Spruce Peak, so we made our way over to the Sensation Quad. We headed down in the Main Street area, and eventually started exploring novel regions of trees since it was the kind of day where you could hit terrain of almost any pitch or tree density. We descended into some steep trees that led down to one of the on-mountain maintenance buildings along Main Street, with little idea of what it would be like, and not surprisingly there were some great lines down through the center of the steep streambed that drained the area. Seeing the snow on Spruce Line as we rode the lift had us venture there on the next run, and the traffic had been so minimal in many areas that we got some really long shots of untracked snow. The entirety of the line was open for skiing, and indeed there are some very steep shots in there that we’d never skied before. They really kept us on our toes, and I was sent for quite a ride when I unknowingly came into one of the steep sections at high speed. We shared the run with a small group of Telemark skiers, who were having a hoot watching Ty and Dylan play around in the deep snow. Next time up it was Upper Smuggler’s, catching the steep terrain on its bottom section, where we connected to Ridge Run and some of the precipitous lines in the nearby trees that Mike Cannon had shown us in the past. 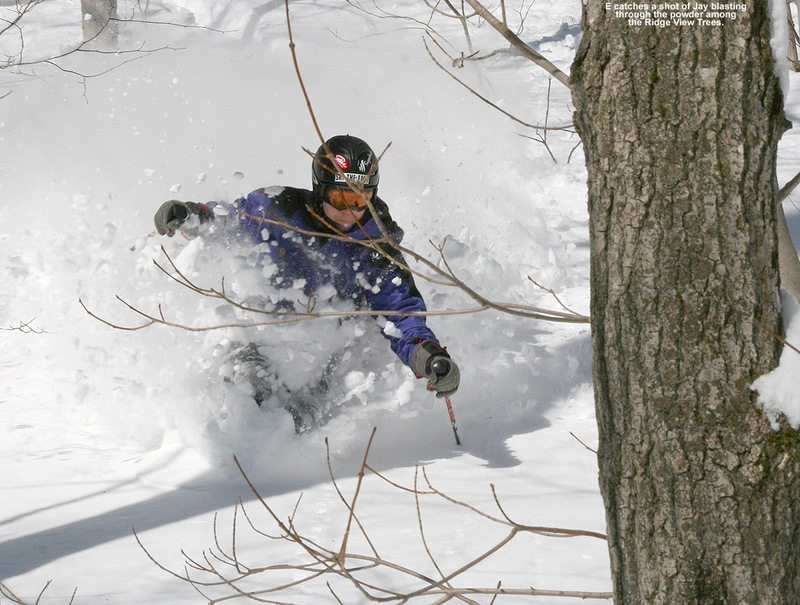 People had certainly skied those main shots by then, but just a little venturing afield revealed the acres of untracked snow that lay in the trees. And boy that powder was deep – it was a very good idea to try catching the traverses set up by others, because wading through the snow on your own took a good deal more time and effort. We’d burned through the morning at that point, and it was time to get fueled up for the boy’s afternoon school program session. We ate at the Great Room Grill, and were joined by some of the other BJAMS families. I got myself an order of the fish tacos, which were again quite good, and I noticed that Molly had some sushi. It turns out that they have sushi available at the Great Room Grill in a refrigerated case, so I am definitely going to have to check that out as an option when we’re there. It would be amazing if they started offering it freshly prepared at one of the stations (I bet it would be a hit if it the quality was decent) but I can’t wait to try what they’ve got anyway. During lunch, E had swapped her alpine gear for her snowboard gear, as she’d be instructing snowboarding for the rest of the day, but Ty and Dylan and I kept our fat skis on and got ready for the afternoon with a warm up run on West Smuggler’s and West Slope. Back up at the base we met up with Claire, Luke, and Jack to fill out our group, and we took everyone back to Sensation so could hit the great powder on Spruce Line. There were a few more tracks since the morning, but it really hadn’t seen that much additional traffic. We tackled Upper Smuggler’s on the next run, enjoying the way that the bountiful fresh snow had resurfaced even the steepest terrain. 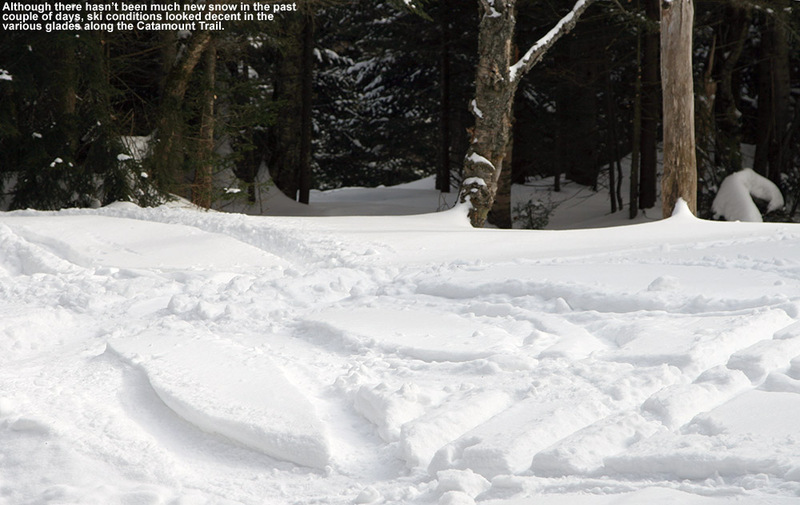 Even with the three feet of snow it was still possible to occasionally encounter the subsurface though, showing just how much snow it takes to cover some of the high angle terrain. 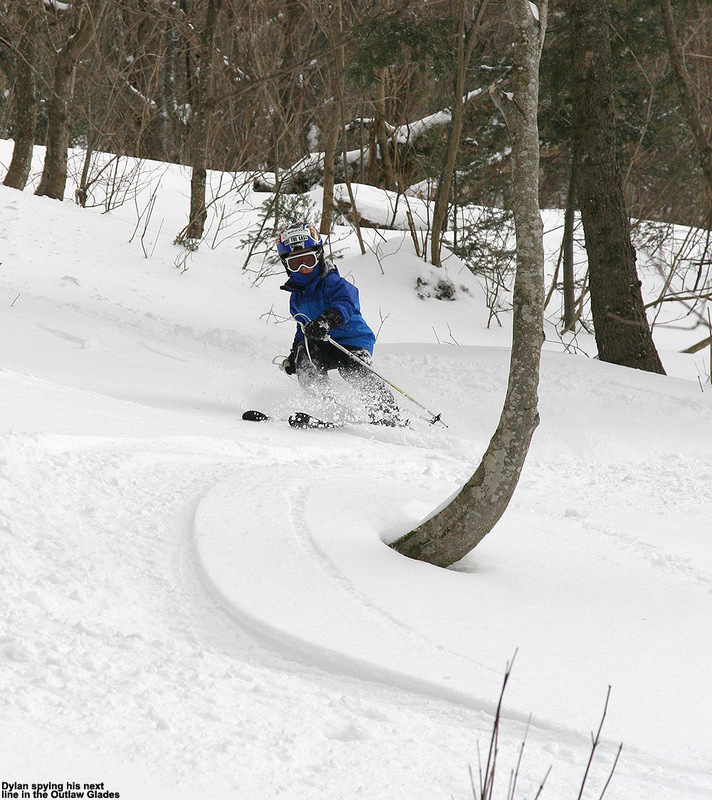 We cut across to Ridge Run, where some of the boys dropped into the steep slopes of the Ridge Run trees. 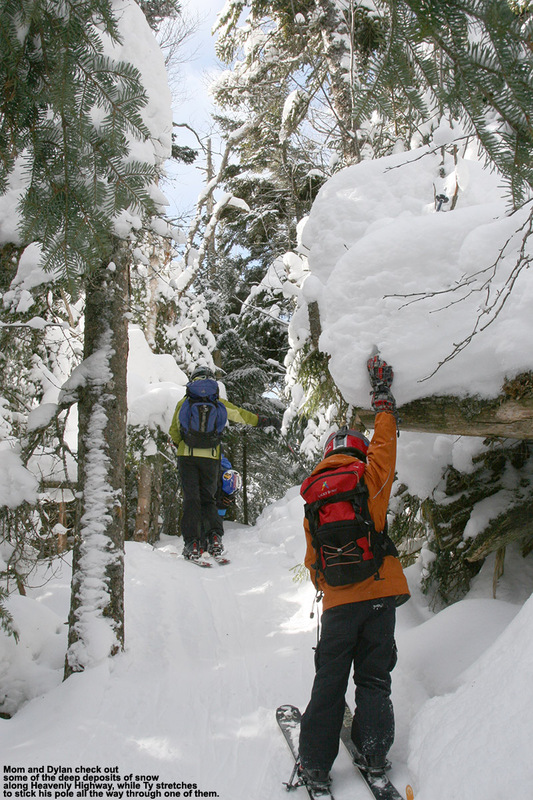 I dove into the trees as well, and ski cutting across steep pitches easily set off big sloughs of the deep snow – I wasn’t surprised to hear that avalanche warnings had been put out for the Mt. Mansfield/Smuggler’s Notch area. We finished off the afternoon over on Mansfield, where I introduced everyone to the Chin Clip Streambed. In terms of their abilities, everyone in the group is more than ready for what it has to offer, but I’ve been waiting for the base depths to build to the point where they could enjoy it thoroughly without concern about rocks and the frozen waterfalls. 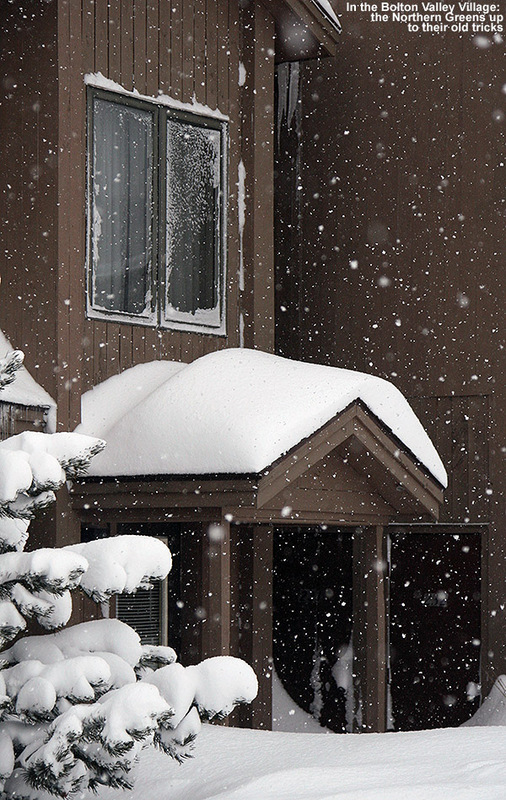 With this big storm and the couple smaller ones that came before it bumping the snow depth at the Mt. Mansfield Stake from roughly four feet midweek to almost seven feet now, it was time. I guided everyone to the entrance, and we dove in. Even for Claire it was a fairly novel experience, as she recalled skiing it once, but it must have been a decade ago. The boys ripped it up, launching jumps off the terrain features and half pipe-like walls of the drainage. Even Luke, who’s probably the most novice in terms of off piste skiing, was looking really good and handling the steep drops smoothly. Claire was definitely challenged by some of the waterfalls and steep, tight areas, but she had a blast. I can’t recall the last time I’d been in that streambed, but the skiing was as amazing as always. There are definitely some advantages to coaching the young advanced group in terms of terrain selection. Most folks are aware of Stowe’s long, continuous vertical drop, and it was obvious today when at one point in the streambed run Ty asked, “Does this thing ever end?” All the boys seemed to be of similar mind, and there was no question that they were getting their fill of turns and challenge; indeed it does seem like that streambed simply goes on forever – in a good way. 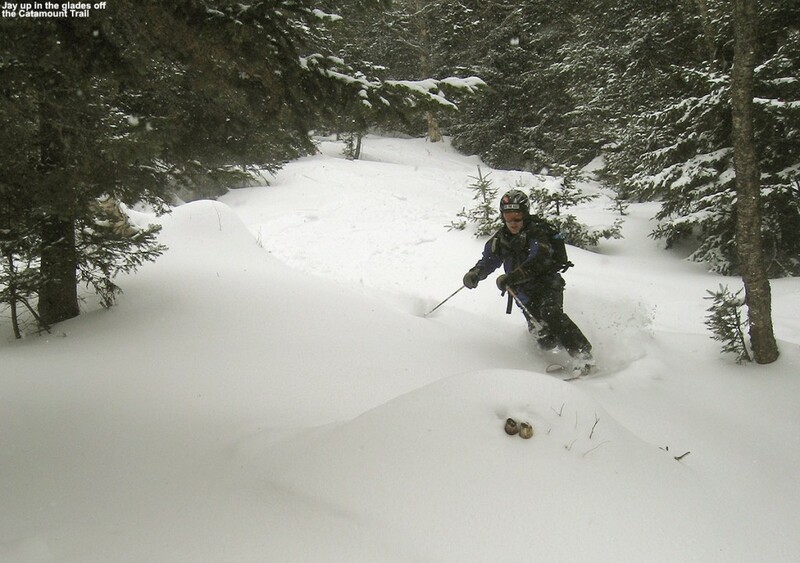 After the romp through the streambed, we hit the gondola again and did a run on Chin Clip proper. 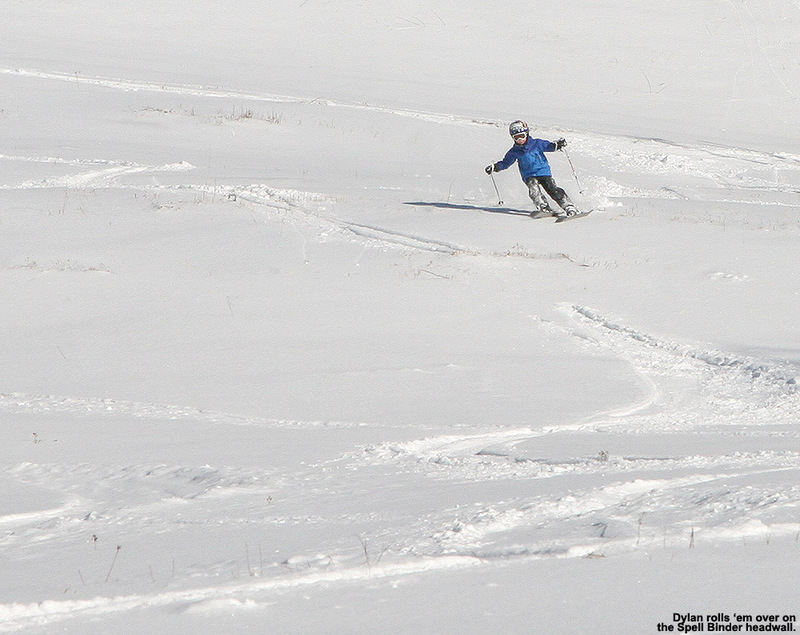 The bump lines were delicious and soft, and the boys got worked hard for another descent. With the early afternoon runs on Spruce topped off with a few thousand vertical feet of steep bumps and off piste in the afternoon, all the boys were cooked. Ty and Dylan, with the additional morning full of powder runs, were especially spent and when we headed back to the Spruce Peak Village they called an afternoon and hit the s’mores at the fire pit. Jack and Luke were game for one more run, so I joined them for a run on West Run/West Slope. It was a good mellow finish to an exciting day enjoying what has clearly been the storm of the season up to this point. The National Weather Service in Burlington has put out Winter Weather Advisories and Winter Storm Warnings for the upcoming winter storm in our area. With our recent return to wintrier weather, three storms have been in the forecast, and thus far each one has been topping the previous one in terms of mountain snowfall. The first one came through Tuesday night into yesterday, and dropped 1.7” of snow here at the house and a few inches in the mountains. 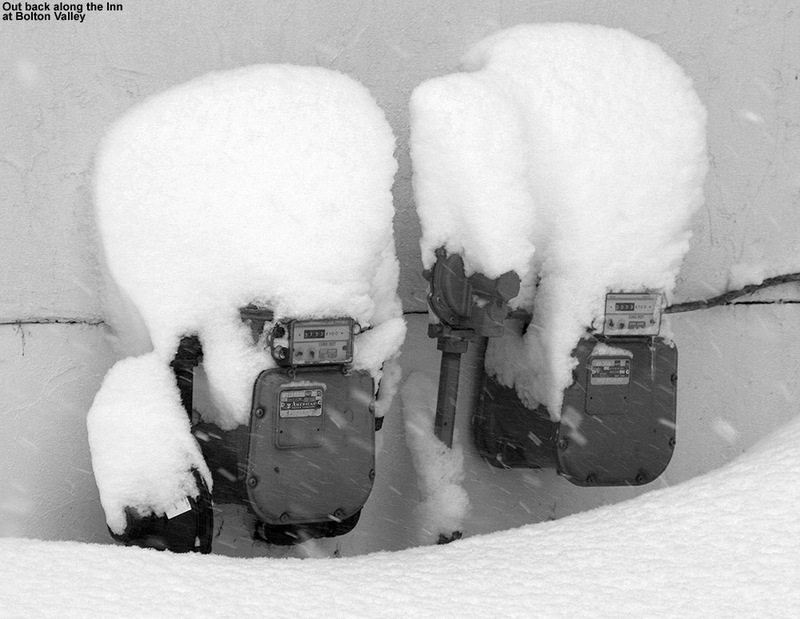 The second system started up yesterday, and while we picked up 0.5″ at our house in the valley, it was definitely a step up in accumulation for the northern mountains. 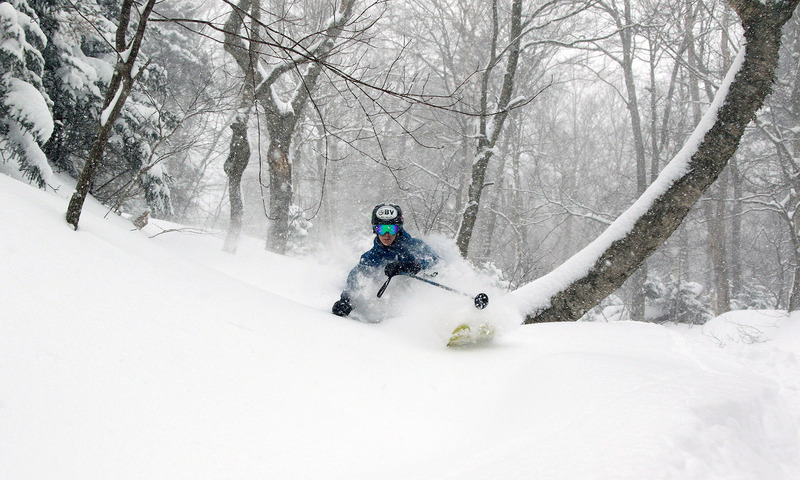 With the addition of this second storm, two-day snow totals are just shy of the 1 foot mark at some of the Northern resorts like Jay Peak and Smuggler’s Notch, with totals tapering to the 5 to 8-inch range in the Sugarbush through Stowe stretch of the spine. I caught some turns yesterday at Bolton and the skiing was already excellent. The third storm in this triumvirate is expected to start today, and depending on how it plays out with the mountain upslope snow, another 1 to 2 feet could be added in the mountains on top of what was already received from the first two storms. Winter Storm Warnings are up for many areas, and this morning’s Storm Total Snowfall Map from the National Weather Service Office in Burlington is added below. In any event, with the moderate density snow already down from the first two systems, whatever this storm delivers, the potential is there for a great weekend on the slopes. The Storm Total Snowfall Forecast map for the morning of February 24, 2012 for the upcoming winter storm – 1 to 2 additional feet of snow are expected in the mountains. 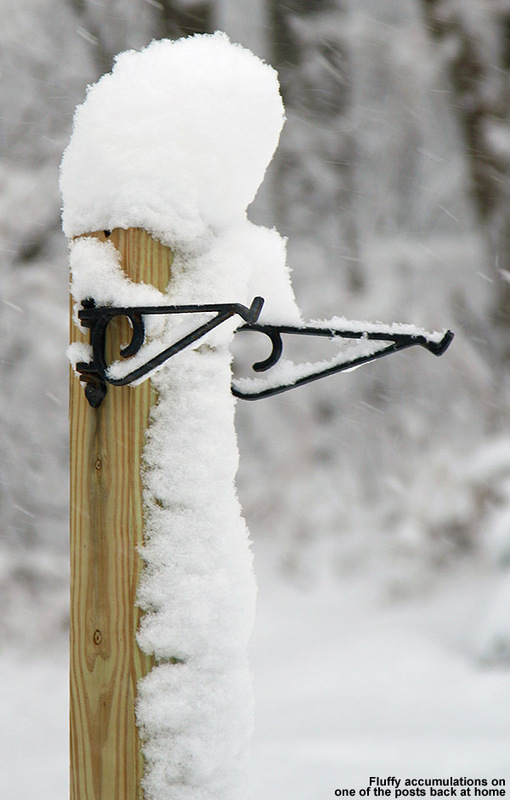 Snow totals from this storm were quite impressive. I’ve put together the north to south snowfall totals I’ve seen from the Vermont ski areas for this storm (list 1) and the sum of all three storms we’ve had since midweek (list 2). As is often the case, there’s a very clear north to south gradient for snowfall, this time with the northern resorts measuring in feet, while the southern resorts are measuring in inches. 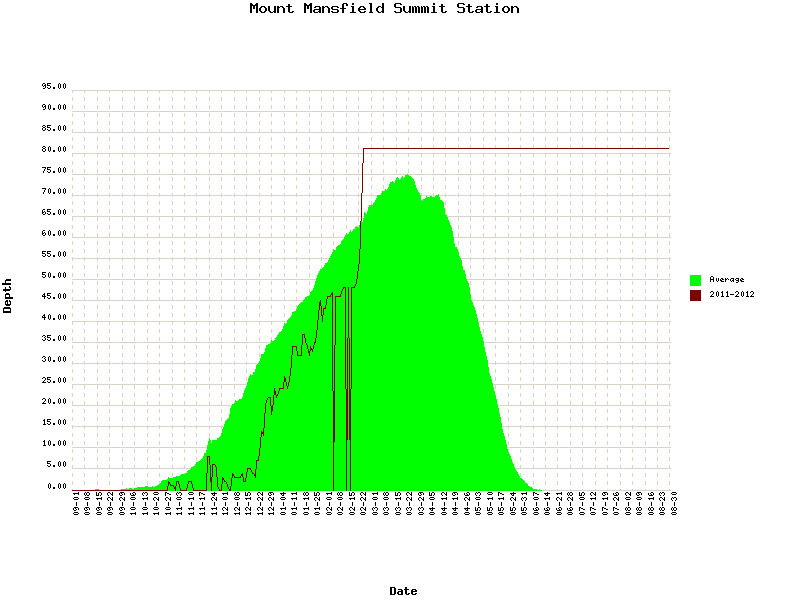 This was a great enhancement to the snow depths in the northern and central resorts, and it looks like roughly 2 inches of liquid went into the snowpack on Mansfield. You know it’s a decent storm cycle period when the depth of snowpack at the stake goes from a below average 49 inches on Wednesday, to an above average 81 inches as of today. For more full details on this storm, head to the detailed report at the winter weather section of our website. After a slow stretch of winter weather for much of February, the last third of the month has been picking up in that department. 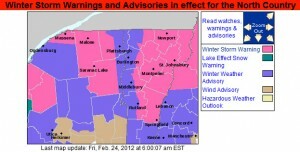 Three systems have been forecast to come through the area, each one with the potential for more snow in the mountains. The first one came through Tuesday night into yesterday, and dropped 1.7” of snow here at the house and a few inches in the mountains. The second system started up yesterday, and as of this morning we’d only picked up some rain here in the valley, but it was definitely a step up in accumulation for the northern mountains. 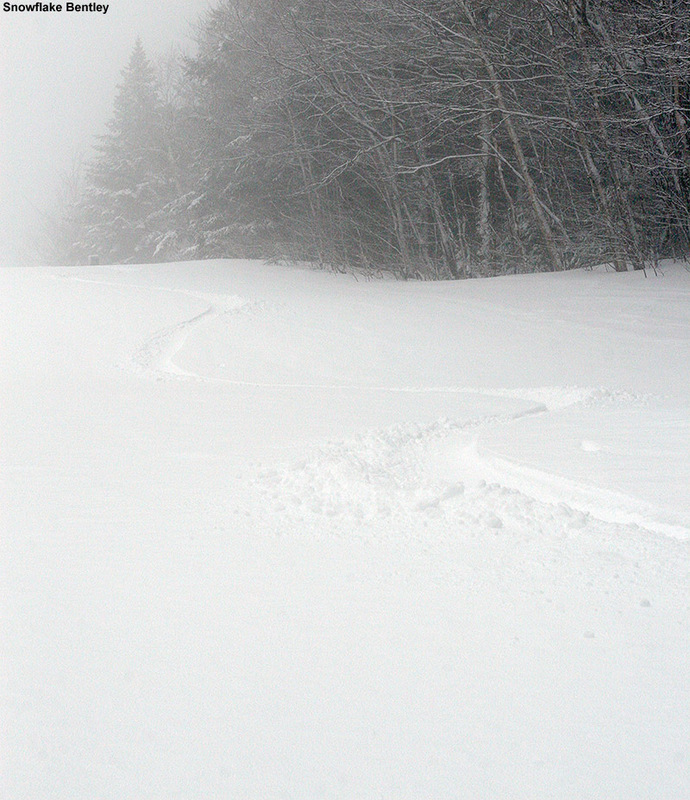 With only rain down here in the valley, it was difficult to assess what the mountains had picked up for snow around 6:00 A.M. when I was trying to make the decision about taking some runs, but fortunately Stowe was out with a nice early report indicating at least 5” up high. With fairly high snow levels, I wasn’t surprised to see that it was a steep accumulation gradient with elevation; Stowe was only reporting 1” new at the base. Still, the high-elevation number of 5” was enough for me to suspect that the main mountain at Bolton, which is all at 2,000’+, would be in great shape, so I prepared my gear and decided to stop in up at the mountain on the way to Burlington. It was interesting to find that it was actually snowing way down at the base of the Bolton Valley Access Road (340’), but there was just a skiff of new white there. In fact, the snow line for getting into to good snow was actually pretty high. Even up at 1,000’ on the access road I’d say there wasn’t much more than a dusting of new snow, and there was probably only an inch up at the Timberline Base at 1,500’. In the Village at 2,100’ I found 2-3” of new snow on the ground, although that was probably the accumulation from the last two days because the cars that appeared to have spent the night in the lot probably had an inch or so on them. The temperature there at the main base was 31 F, and light snow was falling. I was only about 30 minutes away from the opening of the Vista Quad when I started skinning up the mountain, so I stuck to the Wilderness side to stay out of the way of any potential downhill traffic. Wilderness wasn’t scheduled to open until 10:00 A.M., so I had a good cushion of time. The 2-3” of snow I’d seen at the base grew to 4-5” at ~2,500’ as I headed up Fanny Hill. I made my way toward Upper Crossover, and stopped my ascent at the top of Bolton Outlaw. Up there at around 3,000’, new snow depths were in the 5-6” range. It was past 8:30 A.M. by that point, and I was just starting to hear the hoots and hollers of folks descending off Vista, so I didn’t linger long before I dropped in to see how the turns were going to be. The powder was medium weight, not sticky at all, but with plenty of substance. Still, I was touching down in spots, so it wasn’t completely bottomless with the steepness of Bolton Outlaw. Turns were great though, and if this is just a taste of what’s to come when the third storm gets here, the next couple of days are going to be great on the slopes. 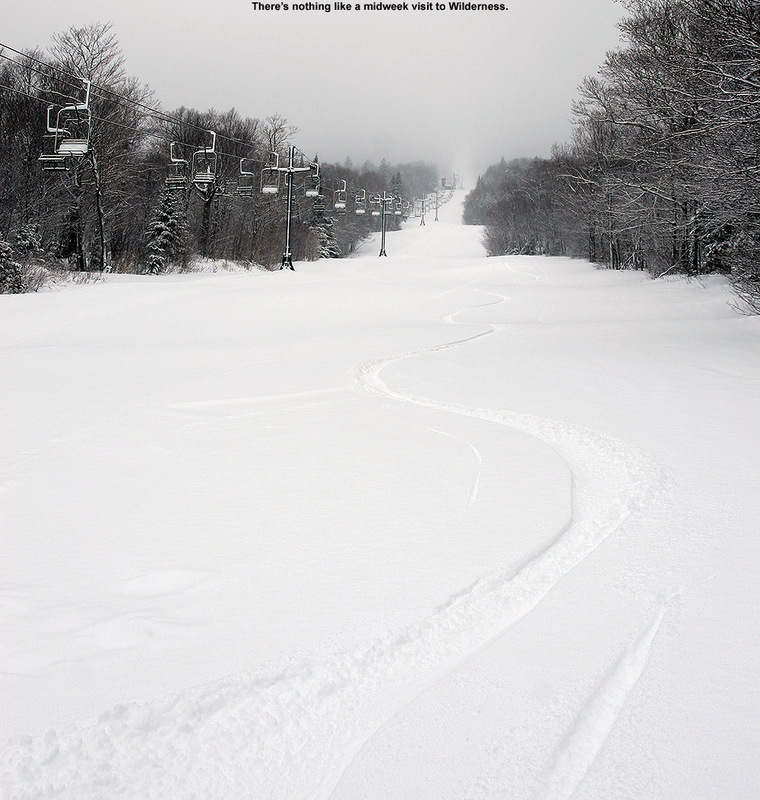 I continued on down to the Wilderness Lift Line, where turns became bottomless with the slightly lesser pitch. Nobody had been down to Wilderness by that point, so it was first tracks all the way down until I merged into the Vista Trails. 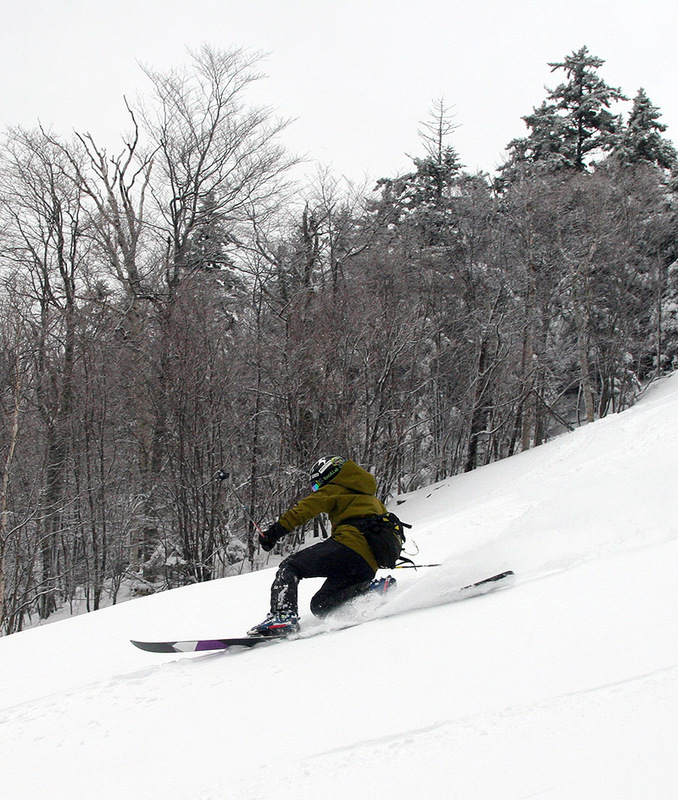 I decided to stick around for another couple lift-served runs, and first hit Hard Luck. It had seen a few tracks, but the turns were excellent. 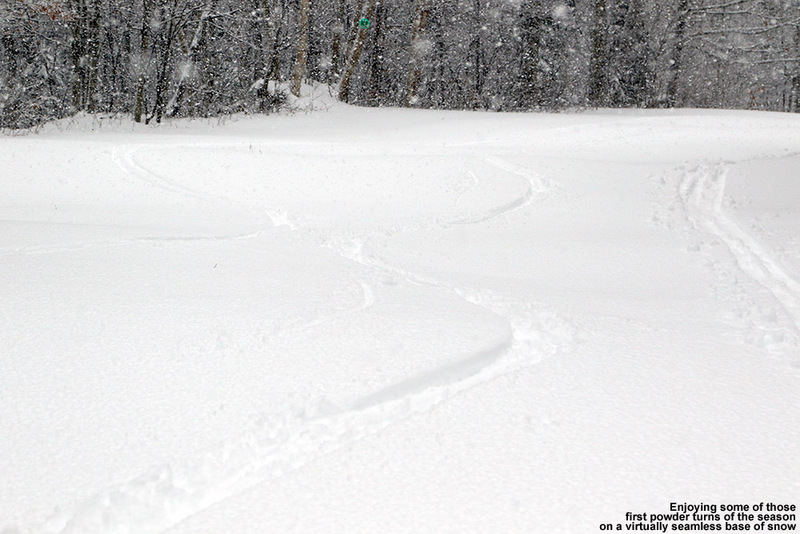 I cut through to Show Off, which was untracked at the point, and the turns were generally bottomless. I finished off with a run below the Vista Quad above the Jungle Jib. 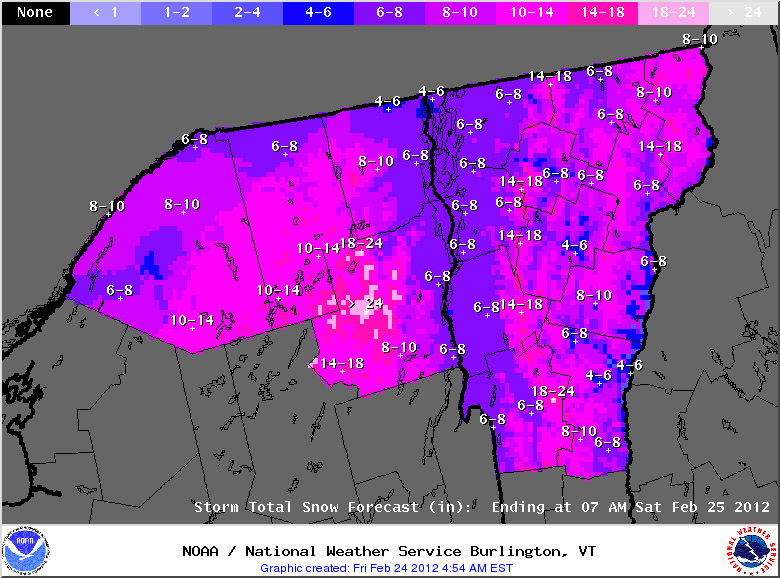 I opted for Vermont 200 on my next run, where I actually found the snow depths topping out around 7”. I hit some woods, and then cut across on Deer Run to get to the top of Snowflake. 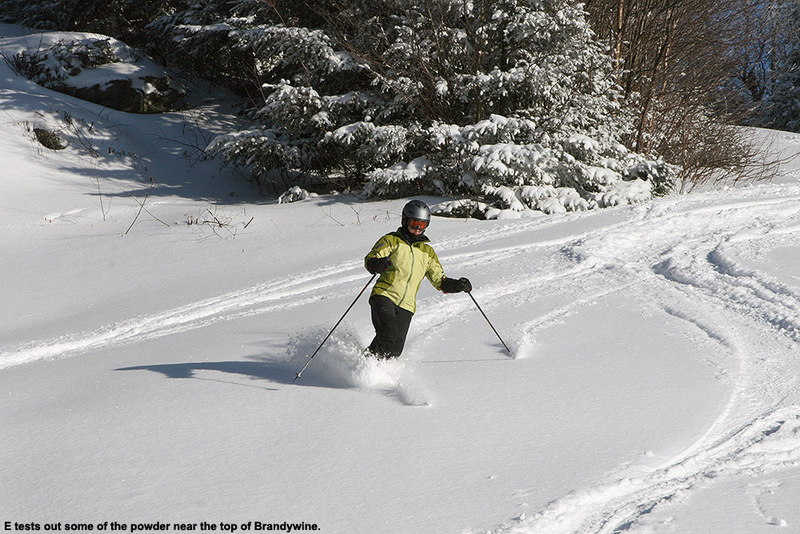 I combined the top part of Snowflake Bentley, which was about half groomed and provided some nice turns, with Lower Foxy, which allowed me to ski past the Wentworth Condos and out the access road. The powder was excellent almost all the way back down to the main base, although I’d say the last couple hundred vertical were just a little thick – certainly enough that I noticed. 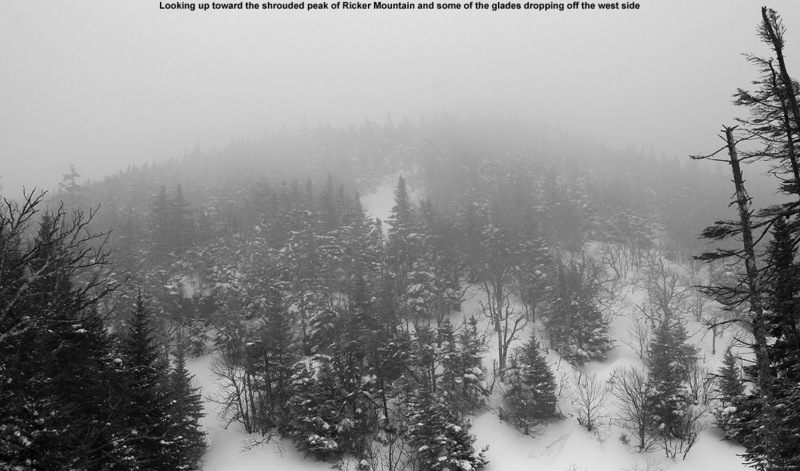 It was easy to see that the main mountain was the place to be though; dropping down to the elevations of Wilderness would likely have seen a dramatic decrease in both the quantity and quality of the powder. 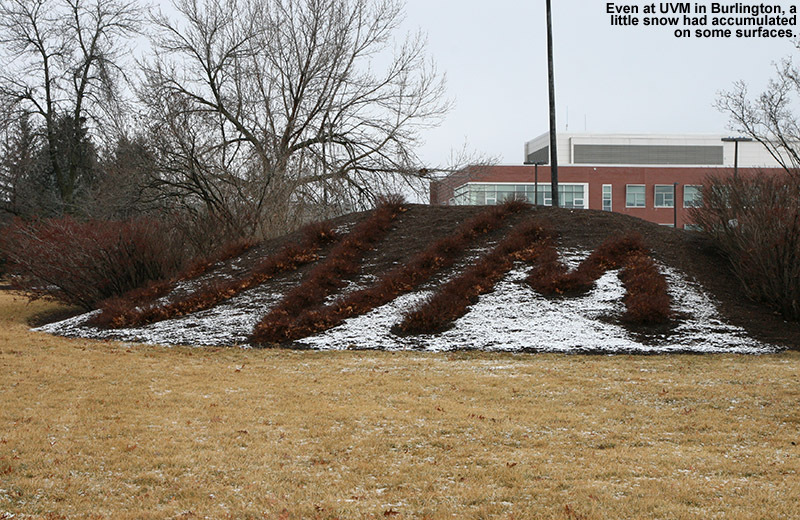 A touch of snow remained among the "UVM bushes" this morning. The temperature was still at 31 F when I was leaving the mountain, and the light snow continued to fall as it has the entire time I was at the mountain. 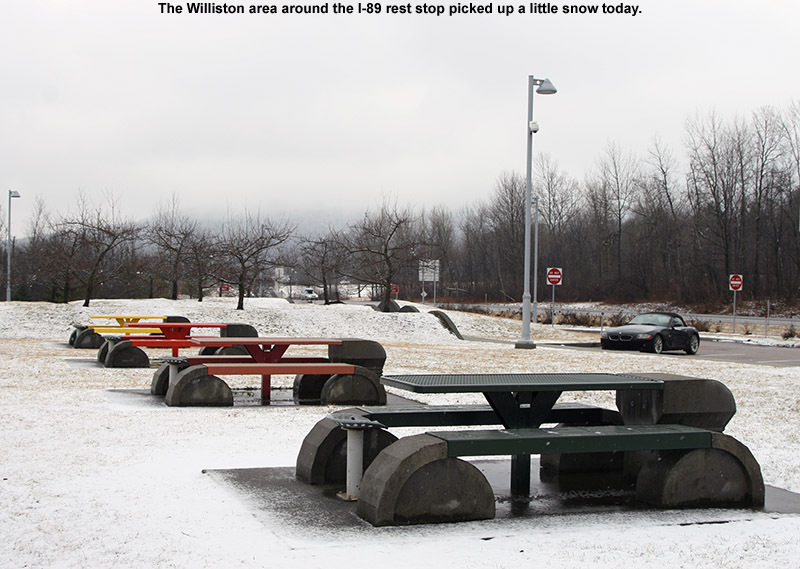 The temperature was in the mid 30s F back down in the Winooski Valley, and on the way into Burlington, I saw that there were actually pockets of accumulation even in the lower elevations, with a decent coating in Richmond, and another good coating at the I-89 rest area in Williston. 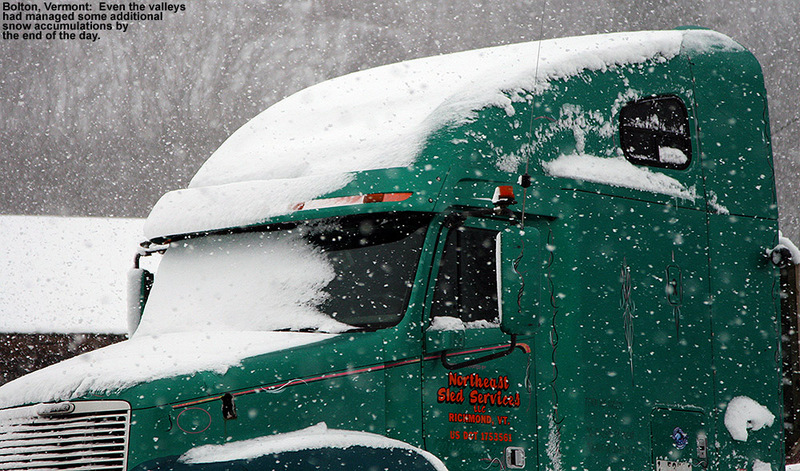 There were even a few pockets of accumulation visible at UVM. 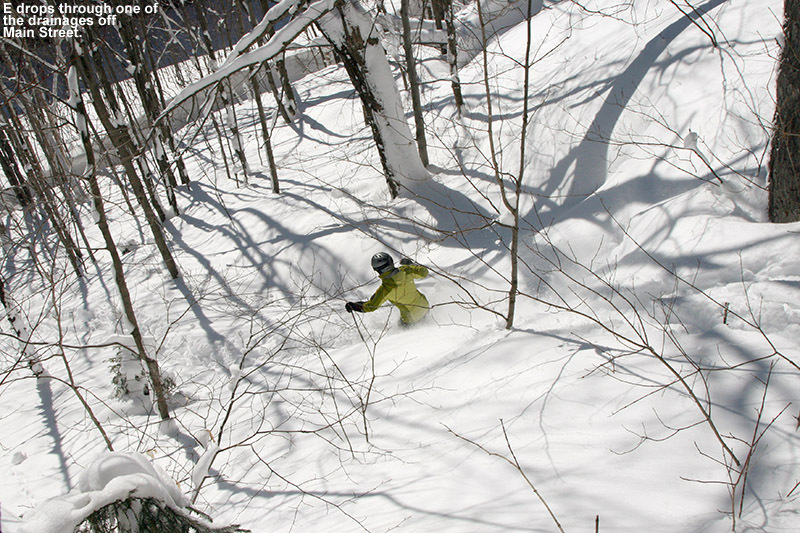 With the addition of this second storm, two-day snow totals are just shy of the 1 foot mark at some of the Northern resorts like Jay Peak and Smuggler’s Notch, with totals tapering to the 5 to 8-inch range in the Sugarbush through Stowe stretch of the spine. So, we’ve already had a nice couple of appetizers leading up to the third storm, which is expected to start tomorrow. Winter Storm Warnings are up for the mountains and mountain valleys, with 6 to 10 inches of snow expected through 7 A.M. Saturday, and then additional upslope snow on top of that. 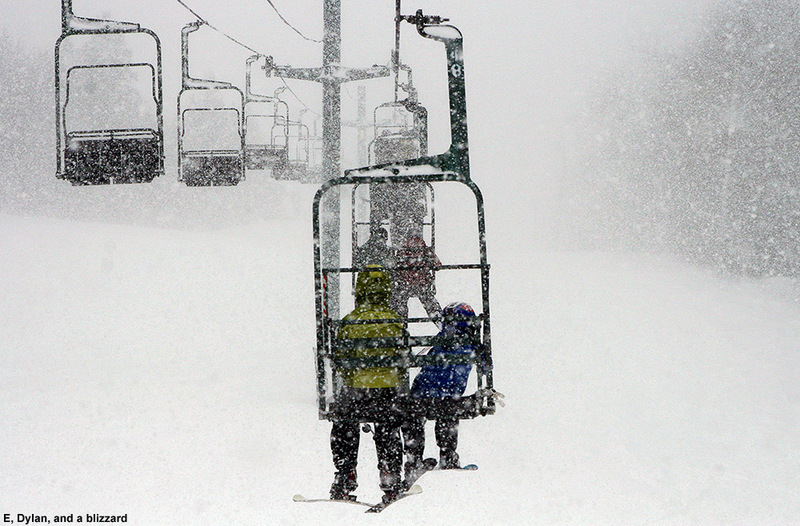 If the third storm comes through as expected, it should be a great weekend out on the slopes. 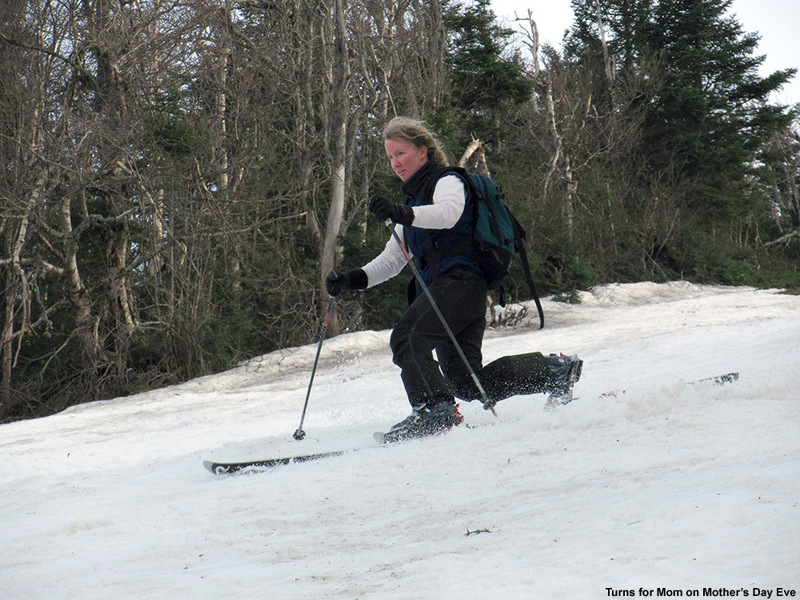 Despite this winter’s low snowfall so far, the snowpack is quite deep along the high elevations of the Catamount Ski Trail and Bolton Valley’s backcountry network. A little fresh snow fell when we were out on our tour in the Bolton Valley backcountry yesterday, but in general we’ve been in between systems over the past couple days. 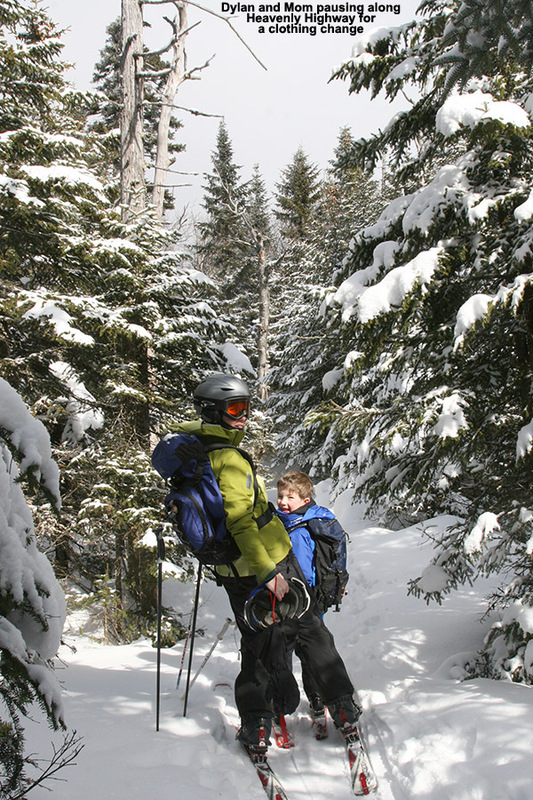 That’s presented a great opportunity to explore the backcountry with the boys though, and yesterday they completed their longest tour to date as we took them out to one of the glades along the Catamount Trail. E and the boys had to head back to school today, but I had the holiday off and decided to do a tour similar to yesterday’s, with some additional exploration along the Catamount Trail past the glade we’d visited. I parked down at the edge of the tennis court lots as usual, made my way up to the Wilderness Lift, and connected over to Heavenly Highway from the Wilderness Summit. Snow conditions were very much like yesterday – I checked the depth of the powder atop the base snow along Heavenly Highway and found it to be around 9 to 10 inches. 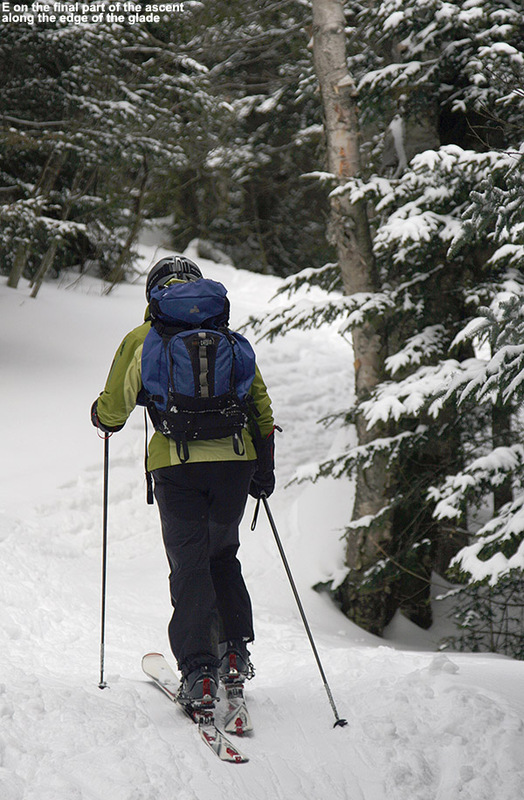 The big change from yesterday was that there was nobody out on the backcountry network trails – Monday afternoon on a holiday weekend must have meant that most people had already headed home. Once past that first glade along the Catamount Trail, I was into what was for me, uncharted territory. 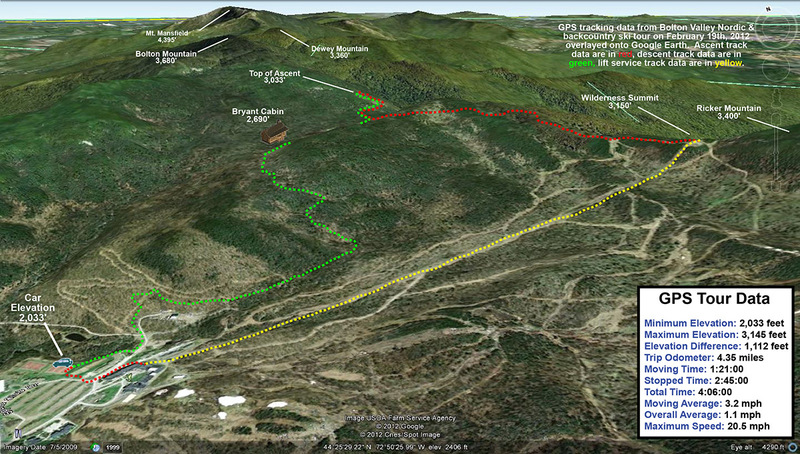 I continued along the trail, which gradually rose as it headed generally north-northwest toward Bolton Mountain. One of the most impressive aspects of this part of the trail was seeing the impressive depths of snow that have built up, in what has really been a very low season for snowfall. The general area below the Catamount Trail junction with Raven’s Wind, which is sheltered like parts of Heavenly Highway, revealed evergreens that were just choked, buried, and ensconced with snow. 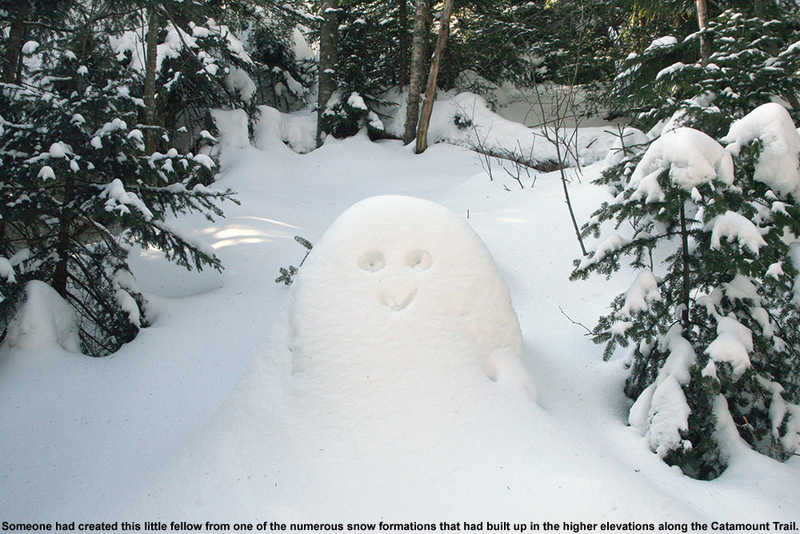 Around every corner I was finding fantastic, gravity-defying deposits of powder. 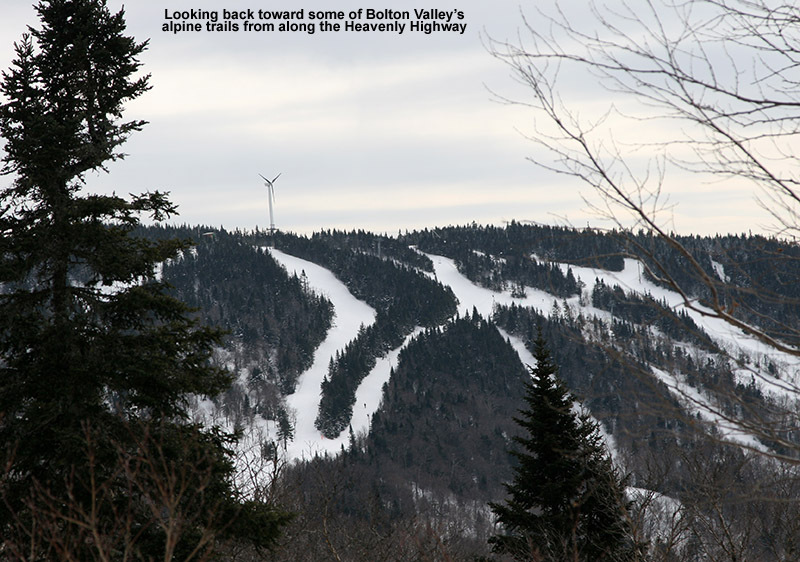 Once past the junction with Raven’s Wind, which marks the last outpost of Bolton’s backcountry network, the Catamount Trail began to level off and skirt along the eastern edge of Bolton Mountain. 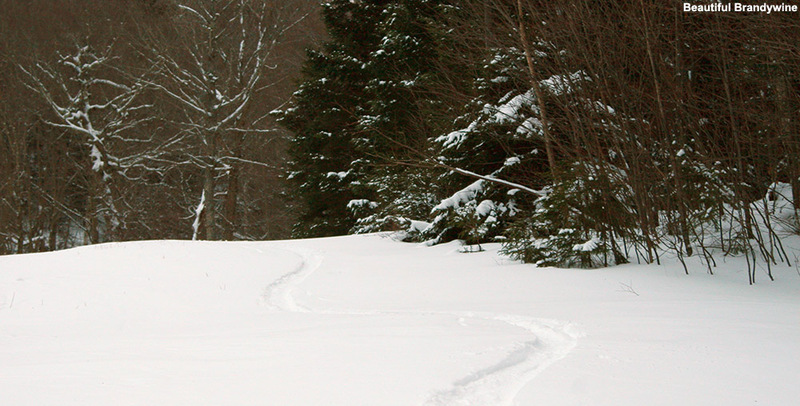 At over 3,300’ in elevation, this area marks the highest point on the entire Catamount Trail. 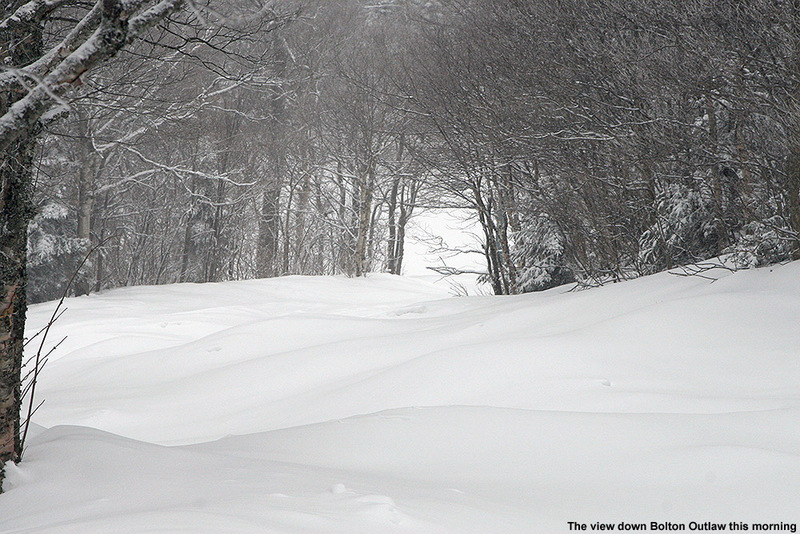 Ski tracks leading to the Cotton Brook area provide a rough sense of the snow conditions out along the Catamount Trail today. I contoured along the southeast face of Bolton Mountain as the trail switched to a northeasterly direction; I couldn’t see the summit of Bolton Mountain (3,680’) through all the evergreens, but the steep rise in the terrain off to my left let me know that it was looming up there about 400’ vertical feet above me. As I continued to scan the elevated terrain to my left, I quickly noticed that the density of the evergreens had become sparser, and I began to see potential ski lines through the trees. I eventually decided that I’d gone far enough out on the trail for the day, and chose a spot to ascend a bit and see if I could start my descent up in the trees above me. The terrain was fairly steep, but there was that consolidated base below that top layer of powder, so I wasn’t wallowing in bottomless fluff as I broke trail. With the evergreens all around me, the air was deathly still. It was so quiet that even the nearly silent shuffling of my skins through the snow had me feeling like a marching band crashing through a sleepy town in the middle of the night. I continued generally westward and upward, following what looked to be the most open lines through the trees. The terrain began to flatten out ahead of me, and I could see on my GPS that I was approaching the Long Trail along the ridgeline; I decided that that was a good goal to mark as my turnaround point. I know that I was very close to meeting up with the trail when I finally stopped my ascent, as I was definitely on the ridgeline and the land clearly began to drop off to the west. I was tempted to go a little farther and make the trail connection, but it just didn’t seem worth it to lose elevation. 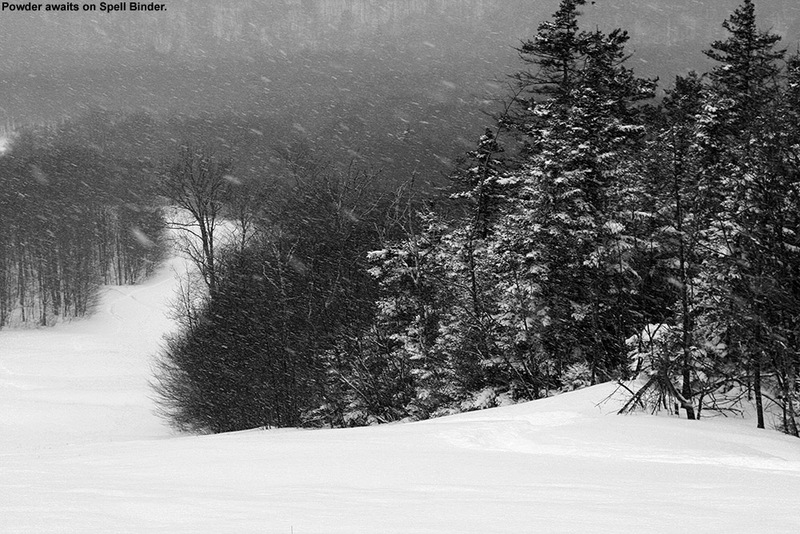 It was after 3:00 P.M., I was well away from the Catamount Trail, and I was alone. It was at least generally downhill back to the Catamount Trail from my location, and there was no need to push my luck. I stripped off my skins and reversed my course, traveling along generally flat, ridgeline terrain at first, and negotiation a steep south-facing gully as well. 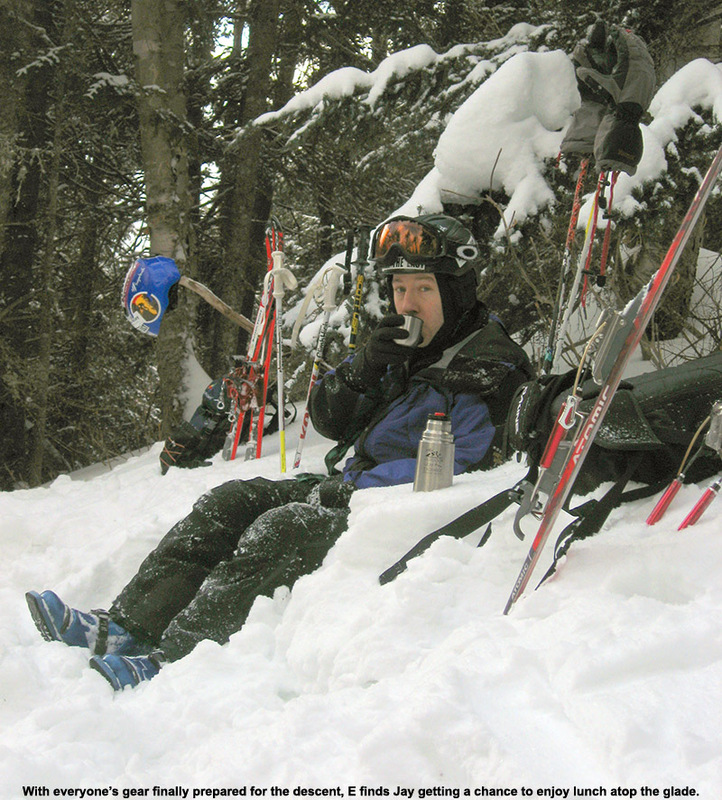 When I’d finished crossing the flattest terrain and could see that I was about to begin the descent to the Catamount Trail, I stopped in a comfortable spot and pulled out some of my food supplies. I ate a Clif Bar and had a couple rounds of the hot tomato soup that I’d packed in my thermos like yesterday. That absolutely hit the spot. I definitely needed the recharge after throwing in all that extra trail breaking on top of the ascent of the Catamount Trail. The energy expenditure had been enough that I was getting a bit drained, and I definitely wanted something in the tank for the descent. Once I stopped moving, the silence around me was redoubled, and it was indeed eerily quiet. 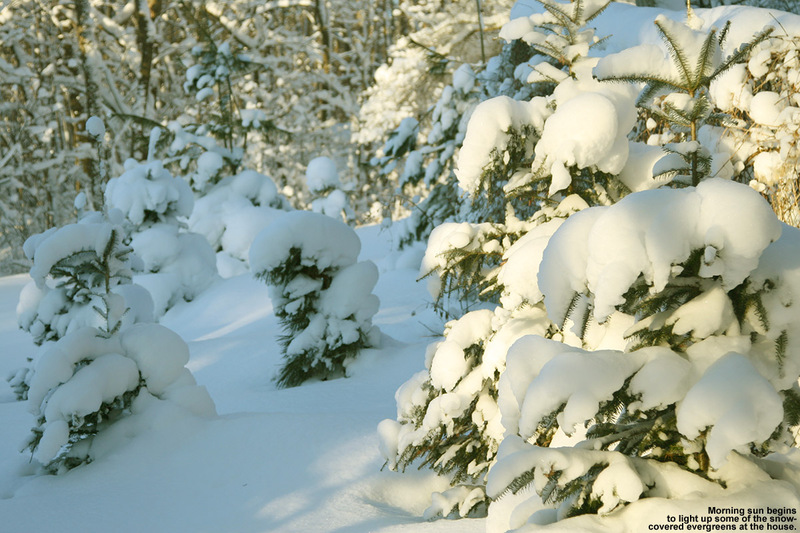 Such is the scene at times when one is alone in the deep woods of winter. I packed up my food and gear and began the real descent through the evergreens. There were indeed some reasonably open spaces and nice turns, but it was steep enough that it really would have been better with deeper powder for the available tree spacing. 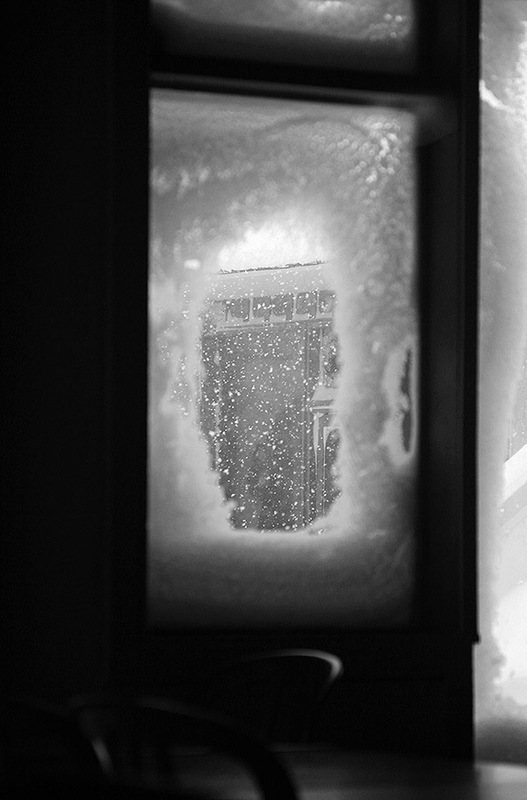 The 9 to 10 inches that were there were OK, but I’d say something around 18 inches would be more appropriate. And, although the natural lines through the trees were good, they could be dramatically enhanced just by clearing off the all the dead branches that were still on the lower parts of the evergreens. That would be a great off-season project for someone to tackle, and the process could continue right on down below the Catamount Trailas well, because the terrain just keeps going. 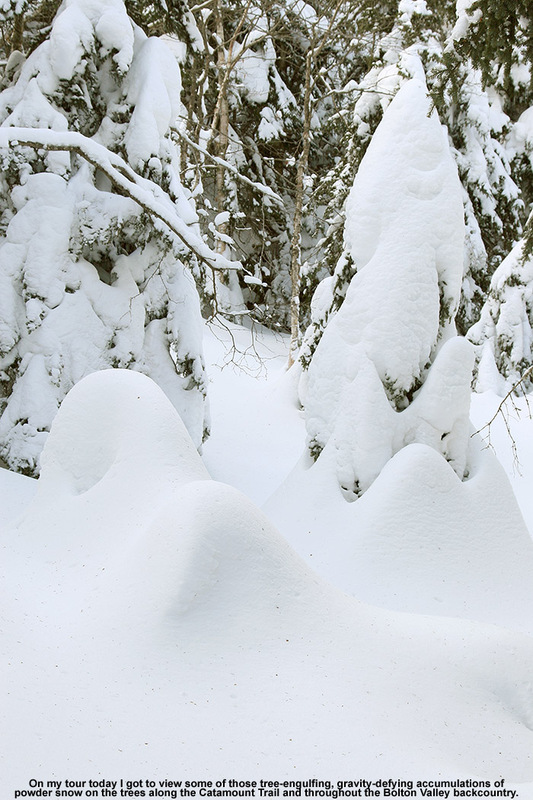 In any event, even in its natural state I’m keeping that terrain in mind for a place to visit after a reasonably big dump with depths of powder that will fit the pitch and spacing of the trees. I popped out on the Catamount Trail and had begun to head back toward the resort, when I ran into the first pair of people I’d seen all day. It was a couple of younger guys, and they asked me if I knew the area. I said that I knew it fairly well, but when they asked me what lay to the north of where we were, I told them that that was out of my range of knowledge – I was currently the farthest north I’d ever been on this section of trail. In terms of descents, I said that I’d recommend descending back in the Cotton Brook area if they were unsure of where they were, because I knew that one could ascend back out of there quite easily. It was likely that one could traverse and get out from areas to the north as well, but one never knows just what the terrain would be like until they’re actually in there. I’m not sure what they ended up doing, but since it was well after 3:00 P.M. by that point, I hope they made an appropriate choice. I was tempted to do a little extra exploration on my return trip, especially as I looked at the vast expanse of evergreens below me. Some trees even displayed that hanging moss that I’ve often seen in the mountains of the Pacific Northwest and British Columbia; as if the deep snowpack wasn’t enough, the sight of the moss seemed to me like a real testament to just how much precipitation falls in the higher elevations of the Northern Greens. As much as it would have been nice to poke around, ultimately I wasn’t willing to explore a descent down into the Cotton Brook area with the time of day, so I descended back toward the resort on the Catamount Trail itself. The trail isn’t very wide, so the descent below Raven’s Wind was quite a hoot. Let’s just say that I’m glad that I didn’t “run” into anyone ascending at that time of day. It’s definitely an exhilarating descent back toward the main glade though if you can catch it without any uphill traffic. I enjoyed a descent of the main glade back toward the Cotton Brook Trail junction, but despite the decent amount of powder, the combination of tracked snow, irregular surface underneath, and some previously work by the sun, made it rather challenging and nothing special in terms of flow. It’s definitely time for another storm. I cruised quickly back along the Catamount Trail to the Bryant Cabin area, and headed right onto Gardiner’s Lane and North Slope. I was determined to find that glade that I’d missed with E and the boys yesterday, and after a bit of searching, I did. I made another mental note on the entrance to set myself up for next time, and had a fun ride down through there. When I finally got back down to the lower Nordic trails, I saw a couple of other people, but amazingly that was it for the entire tour of almost six miles. I can’t wait for my next chance to get out in the farther reaches of the Catamount Trail and explore it further. 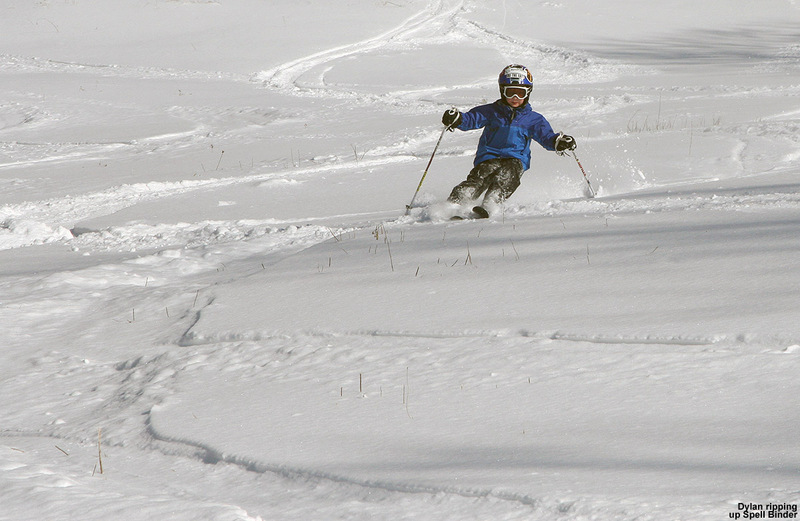 During yesterday’s outing at Bolton, we found decent powder above roughly the 2,000’ level, and ended up skiing several laps off Wilderness to take advantage of the good snow. 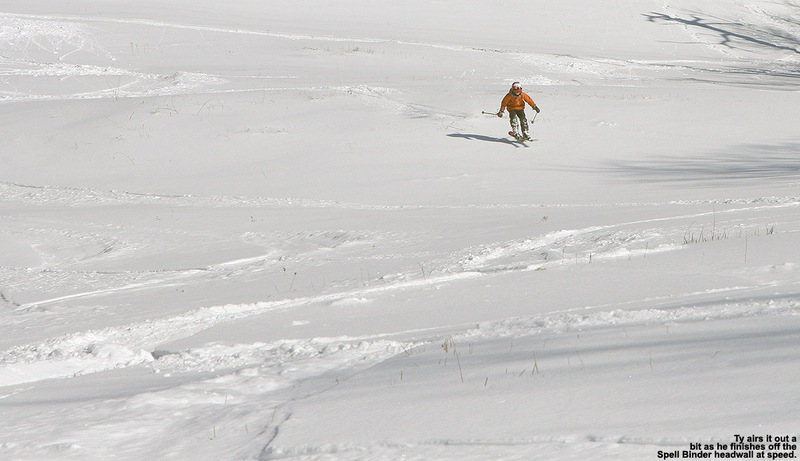 With that in mind, we decided to head out onto the backcountry network today to get in some additional powder skiing. 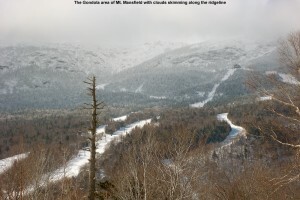 The plan was to begin by riding the Wilderness Lift for a quick elevation assist, then transit on Heavenly Highway to a glade along the Catamount Trail that I’d last skied on January 22nd, 2011. I’ve brought Ty out on Heavenly Highway before, but this would be the first opportunity to get out there with the whole family at once, so that aspect was very exciting. Dylan’s touring range has grown by leaps and bounds over the past couple of seasons, and it seemed like he was ready for a tour this size. With a planned route that would encompass 4 to 5 miles, it would likely be the longest ski tour that either of the boys had done, but with a mile of distance and 1,000’ of vertical coming from the Wilderness Lift, it seemed manageable. The boys each got two packs of GU energy gel, which were stashed in the side pockets of their ski pants to quickly mitigate any concerns about bonking out on the tour. The boys both like the GU (at least the vanilla bean) a lot; we’ve found it helpful for mountain biking in the off season, and it worked quite well for Dylan on our ski tour at Pico in October. Although not quite as warm as yesterday’s highs in the 30s F, the forecast was for temperatures in the upper 20s F and generally clear skies, so weather wasn’t expected to be an issue on the tour. 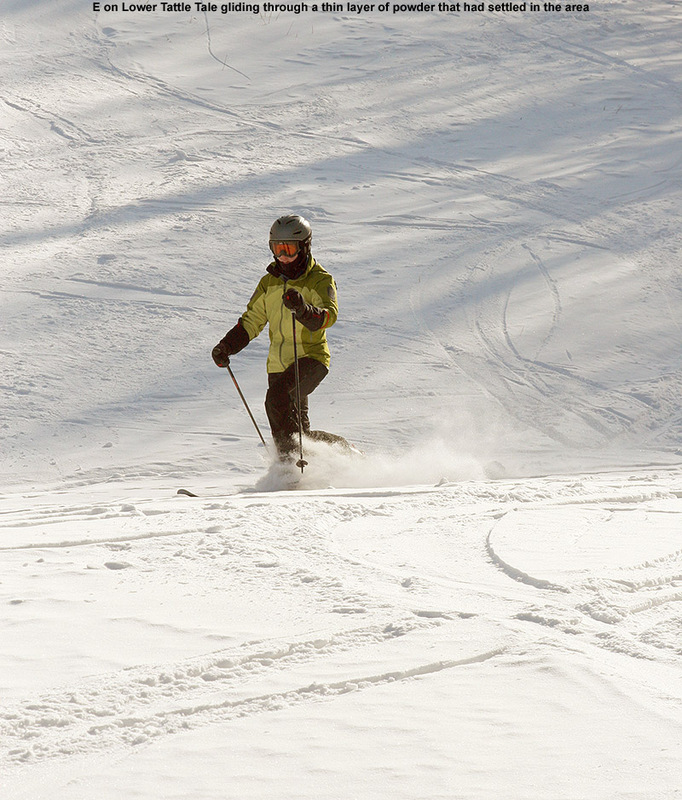 The Wilderness Lift wasn’t opening until 10:00 A.M., so we had plenty of preparation time in the morning. I cooked up a typical ski day big breakfast to ensure the boys would be maxed out on energy, and we loaded up all the gear. 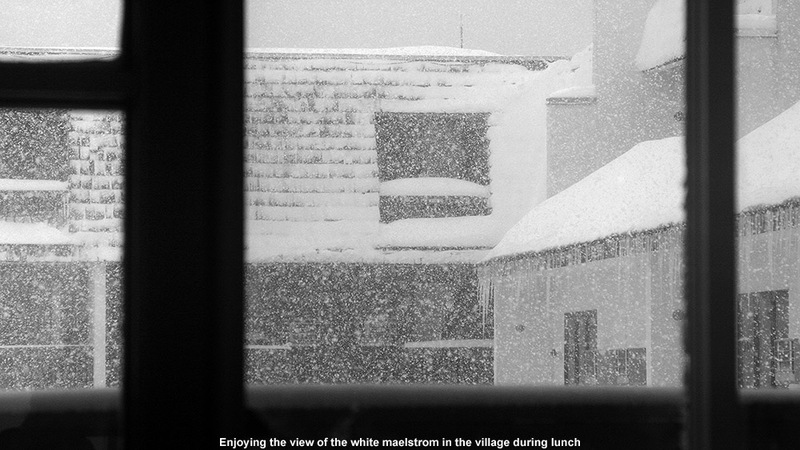 Arriving up in the Village in the mid morning period, we found that the resort was hopping with holiday visitors. I dropped E and the boys off at the ski patrol building at the base of Wilderness, and parked in the tennis court lot down along the Broadway trail. The village lots were filling up fast, but they hadn’t overflowed into the tennis court lot yet; it was just me and a couple other cars parking for Nordic/backcountry activities. I got my gear on and headed up to find E getting the skis ready and helping out the boys with theirs. 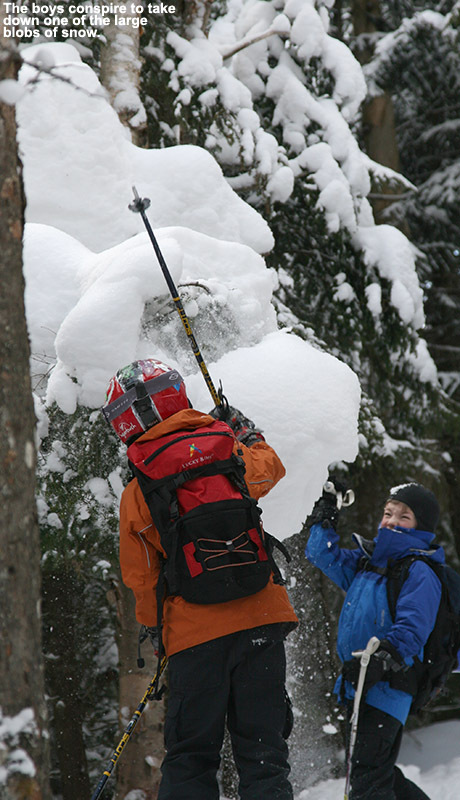 The boys’ Telemark skis are still in the three pin format, so getting them on can be a little tricky. That process combined with having to negotiate a lift ride with a backcountry pack plus a child, makes it E’s least favorite part of one of these types of outings, but everyone got loaded, had a good ride, and disembarked at the Wilderness Summit without incident. Once off the lift, E was able to relax and enjoy the rest of the tour. We skied over to the Heavenly Highway entrance, and strapped on everyone’s skins for the undulating trip across to the Catamount Trail. As we started along, E commented that it seemed like we could do this part without skins if we wanted, but having done parts of that myself before, I assured her that it was much more fun having the skins on. There are enough dips and rolls that you appreciate not having to herring bone up every rise. Dylan took point on our travels across Heavenly Highway, and actually kept a decent pace. It wasn’t long before he decided that he wanted to remove his helmet to cool down a bit. We found tremendous snow formations in the usual sheltered spots along the Heavenly Highway – some stacks of snow on the trees were two to three feet high, revealing just how much snow had built up from recent storms. Ty probed one stack by punching his pole way up through it, and then Ty and Dylan had fun with another thick stack by knocking it off the tree to which it was attached. Even though it’s been a low snow year, elevations up around 3,000’ have still taken on a lot of snow this season, and E was very impressed with how the snowy corridors through the trees made one feel like they were entering some sort of magical world. It was the first time E had been up there, but I’m sure similar experiences by those in the past played a part in how the Heavenly Highway got its name. We’d negotiated a few moderate drops in all the ups and downs of Heavenly Highway, and Ty was very proud that he’d been able to make some Telemark turns on those pitches – it’s certainly tough with the narrow confines and skins on the skis. At the junction with Devil’s Drop we had to make a decision, whether to finish off our trip to the Catamount Trail on Heavenly Highway, or take on the quicker, but more challenging descent of Devil’s Drop trail. I gave everyone an idea of what the two routes were like, and we all joked about the nearly polar opposite names of our two choices. I pointed out that Heavenly Highway would finish off with terrain much like we’d seen up to that point, while Devil’s Drop was, true to its Machiavellian name, a fairly precipitous and tricky drop to negotiate on skis. I figured that everyone would be able to handle it though, and the momentum quickly seemed to shift that way. Before we knew it, Dylan was on his way down toward Devil’s Drop with the rest of the family in tow. We didn’t take off our skins, which actually made the descent kind of fun as the extra friction combined to make it both difficult, sort of like day with sticky snow on the slopes, and easier, almost like having your car holding you back in low gear on a descent. There were a couple of icy patches, and indeed the necessity of fitting skins so that one’s edges are left exposed was never demonstrated so well. I’d say that some pitches on Devil’s Drop are easily in the range of 30 degrees or so, but fortunately the trail has switchbacks to avoid having to ski it at that pitch. Ty did some impressive switchback short-cutting though, working his way through a steep slot that was much more challenging than I would want to take. 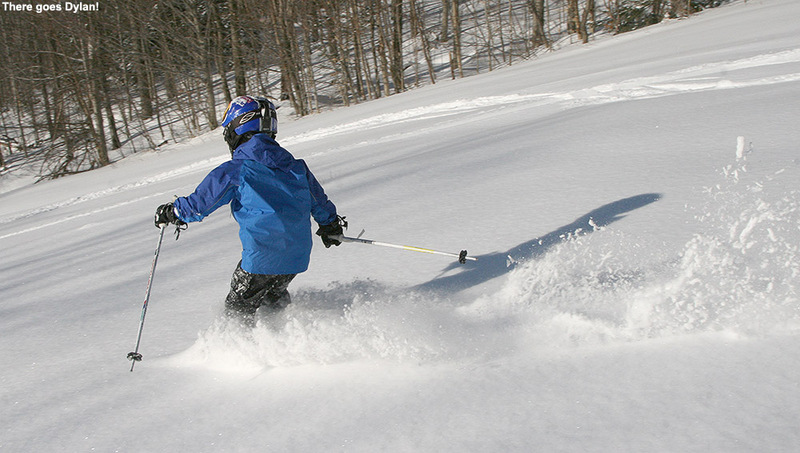 There are actually some nice options for skiing Devil’s Drop and getting some great powder turns, but with the time for transitioning the boys out of their skins and them back into them for the return to the ascent didn’t quite seem worth it. Perhaps on a future trip we’ll add that feature into the tour. At the bottom of Devil’s Drop, after what had seemed like a surprisingly challenging descent to me, I realized that I’d left my Telemark bindings in free pivot touring mode. There’s much less stability in that mode than with the toes locked down – it explained why the drop felt extra challenging today, but I wished I’d realized it before the bottom! Below Devil’s Drop we took a short snack break at the junction with the Catamount Trail, and I told the boys not to eat too much because we weren’t too far from our final destination where we planned to have lunch. With our snack complete, Dylan continued on point, and led us on the Catamount Trail through the wide, flat col between the height of land containing the Devils’ Drop area to the east and the 3,300’ spur of Bolton Mountain to the west. We cruised along through the flats thanks to Dylan’s abiding pace, entering back into the thicker trees in about 5 to 10 minutes and quickly coming to the north intersection with the Cotton Brook Trail. There were lots of people out in that junction area today, and everyone seemed excited to see Ty and Dylan out there. 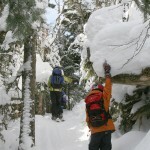 They got lots of encouragement from folks for undertaking such a substantial backcountry tour. E and Ty approach the top of our ascent along the Catamount Trail. 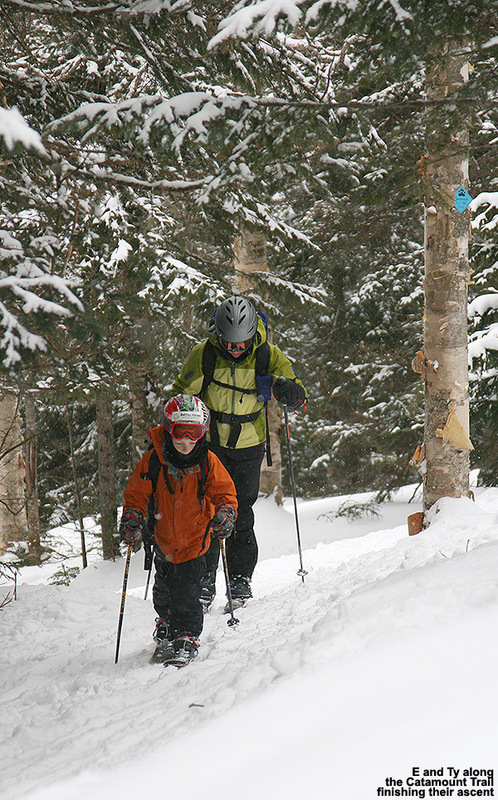 We came to the final leg of our ascent, and I was able to show E and the boys the glade that I was thinking of skiing with them. Dylan continued in the lead, pushing up through the switchbacks along the glade. I could tell that he was getting a little impatient and/or tired, but we let him know we were just minutes away from our stopping point, and he pushed on. Ty was actually more impatient than Dylan at that point, and he clearly needed to be done with the ascent. 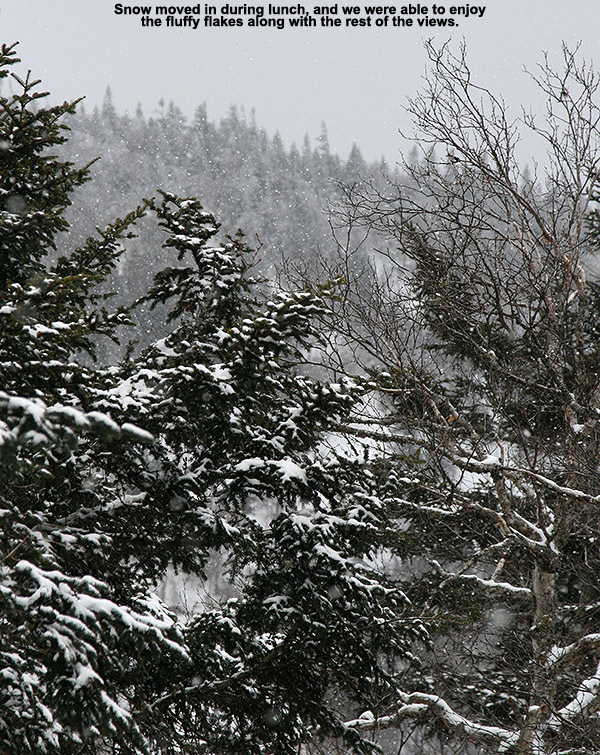 At the top of the glade we found a beautiful powdery spot overlooking the ski terrain and the Catamount Trail, and set everything down to have lunch. Dad finally gets that chance to sit down and enjoy lunch along the trail. 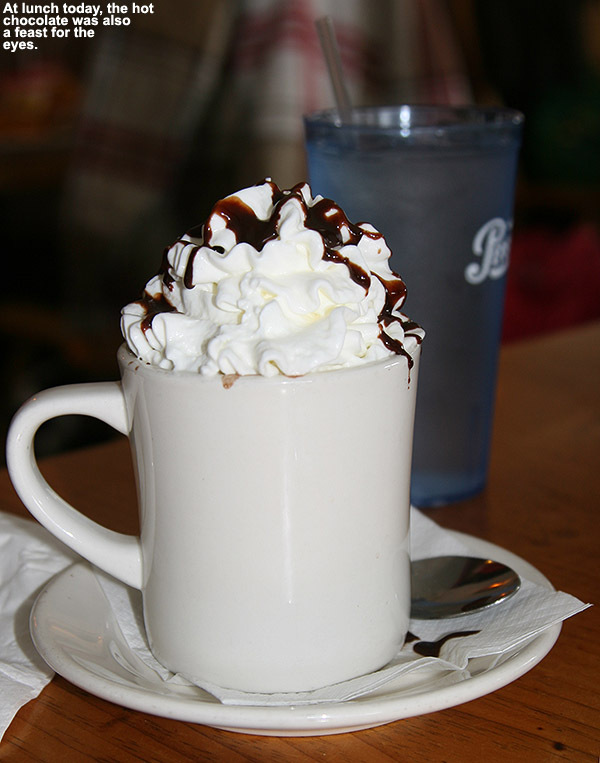 We’d packed a thermos full of tomato soup, and another full of hot chocolate, and I was really anxious to get some food and an energy recharge. 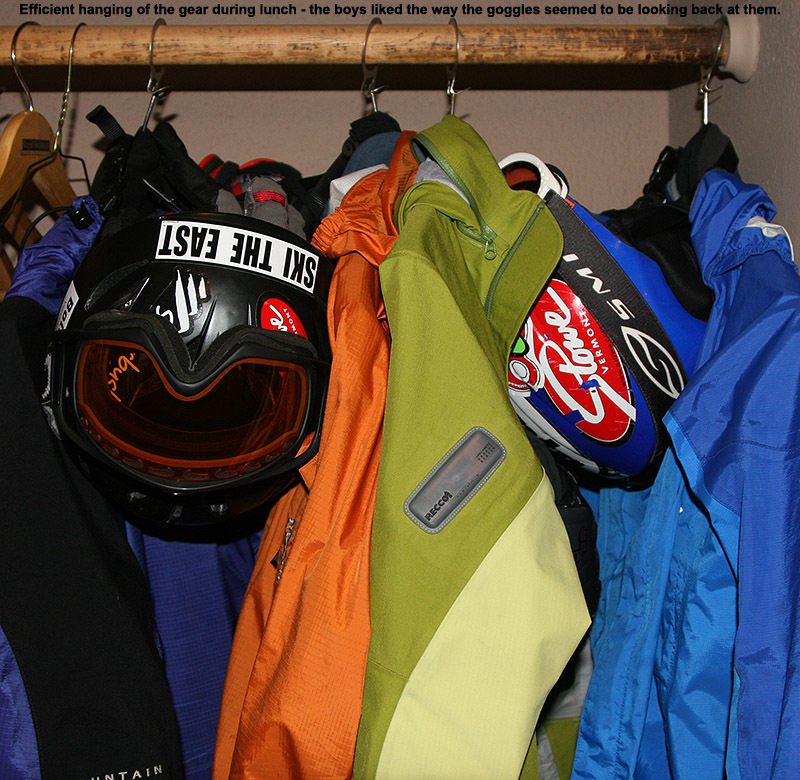 Before I could relax though, I wanted to finish putting away all the skins and preparing all the gear for the descent. Ty and Dylan had clearly been more anxious for the end of the ascent than they were tired, because they were running around like animals having a big snowball fight, and E actually had to work on calming them down so that they weren’t too disruptive to other folks traveling on the trail. The boys played on, but finally I’d taken care of the gear; I fashioned myself a nice soft seat in the powder, and kicked back with some hot soup. I’d been waiting for that for quite a while. To sweeten the scene, just as we’d arrived, it had begun to snow. We had expected mostly clear skies earlier, but clouds moved in quickly, and before we knew it, big fat flakes were swirling all around us. One never knows what Mother Nature will throw at them up at 3,000’ in the Northern Greens, but the beauty of the falling snow was certainly appreciated. Sitting up there overlooking the glade with the fresh snow falling was quite a treat, and one of the folks passing by on the trail commented on what a great lunch spot it seemed to be. After a few rounds of soup, we were finally able to pull ourselves away from the superlative location for a descent of the glade. We found several inches of powder atop the base, but I was surprised that the snow wasn’t quite up to the standards that I thought it was going to be. There appeared to have been just enough traffic and or sun exposure that there was a bit of a crusty layer below the powder. 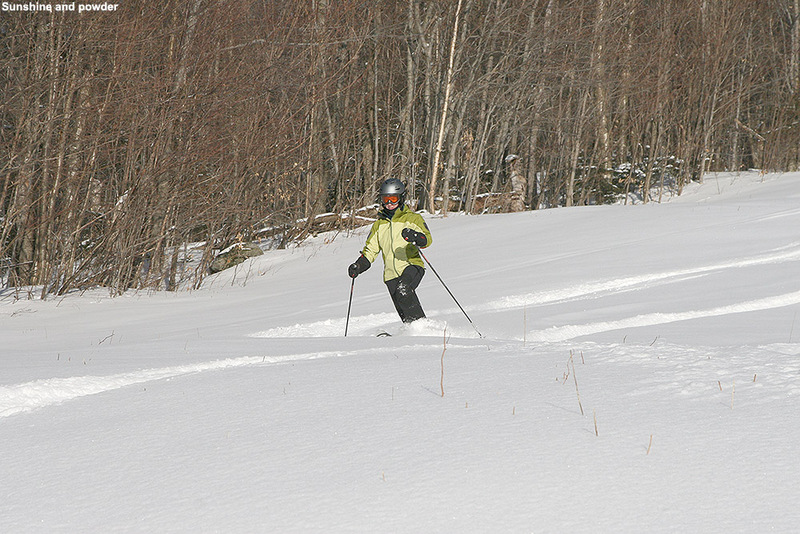 That made the skiing challenging in those spots, but I was able to sneak in some nice turns in areas of untracked snow. Clearly I’m going to have to bring E and the boys back for another trip to experience the primo conditions that are often found there. Once back on the Catamount Trail, Dylan took the lead again, and I told him that he could cruise as fast as he wanted down the trail. 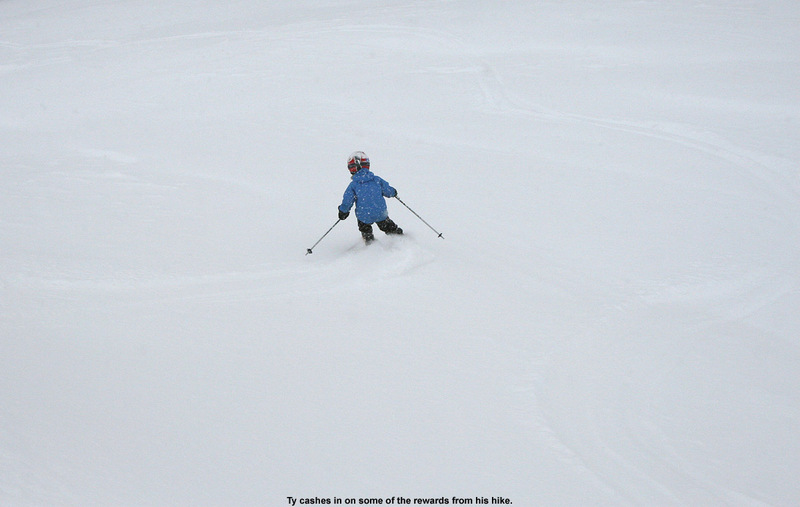 We came rocketing through the flats in the col, and Dylan continued to move along at a marvelous pace. While it’s generally a gentle downhill glide, there are a few short rises and I couldn’t believe how fast we covered the ground. The snow must have been a lot slower the last time I’d been out in that area, but before we knew it we were back at the intersection with Devil’s Drop where we’d had our first snack. We cruised further down the trail, and as soon as Ty and Dylan saw the Bryant Cabin, they headed right toward it like a shot. E and I hadn’t really planned to stop in there unless we needed to, but it was quickly obvious there was no way we were getting past it without a stop. Getting a chance to play around in the cabin is clearly one of the favorite parts of these trips for Ty and Dylan. We pulled into the cabin, which was unoccupied and had no fire going in the woodstove, but with the fairly moderate outside temperature it was comfortable enough that the boys shed some layers. We got into the hot chocolate and snacks for a while, and the boys played around in the upstairs area that they like so much. We saw a couple of groups ascend the Bryant Trail and reach the cabin, but they congregated outside. Eventually the hot chocolate was spent, and we geared up for the final descent leg of the trip to the car. We headed out on Gardiner’s Lane and onto North Slope, and my intent was to take E and the boys down through the North Slope and Gardiner’s Lane glade combination that I’d visited a lot last season. There hasn’t been a lot of traffic at the glade entrance though, so we sailed right past it and continued on North Slope. We ran into Kurt Ries, who was part of a large group collecting at the top of one of the drops on North Slope. Clearly they had a similar idea to us on this fine winter day. 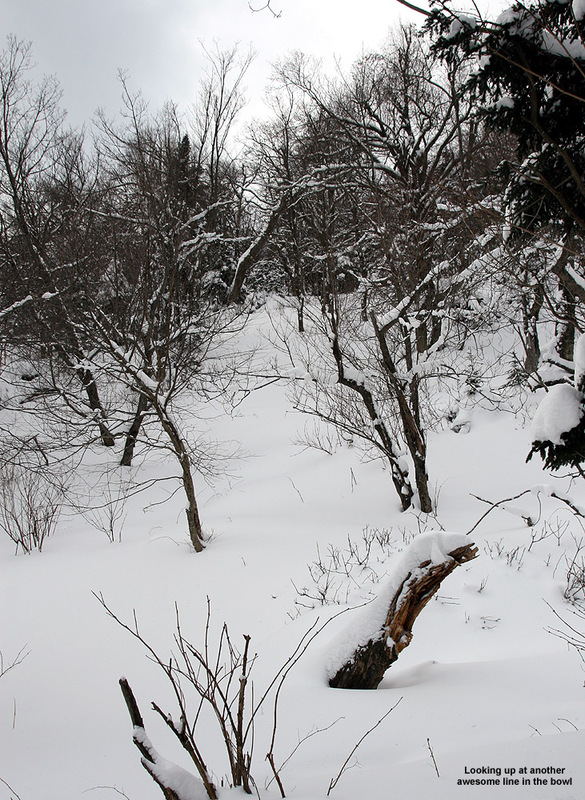 Having missed the glade I’d initially planned to visit, we cut off North Slope and simply explored the woods below. 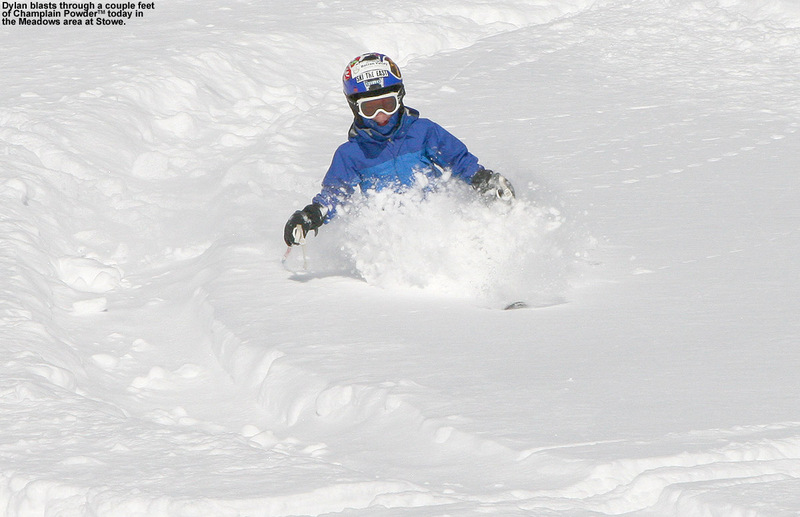 The snow was quite good, with 6+ inches of powder in many spots, and while we found a few good shots, there was nothing too outrageous in terms of providing an extensive amount of turns in open terrain. We connected onto Gardiner’s Lane, and recounted the last time we’d skied it where Dylan had had some binding issues and I’d needed to carry him. He talked about how much fun that had been, but I liked it better with him skiing. 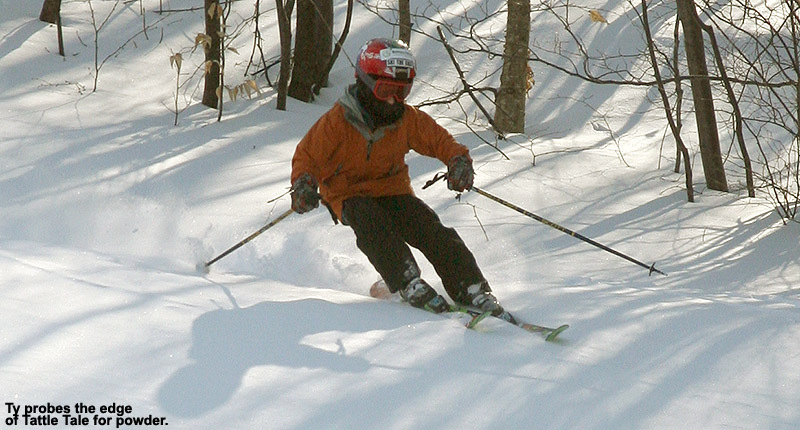 We finished off with a run through the Telemark Practice Slope and the associated glades, and cruised down Broadway to the car. 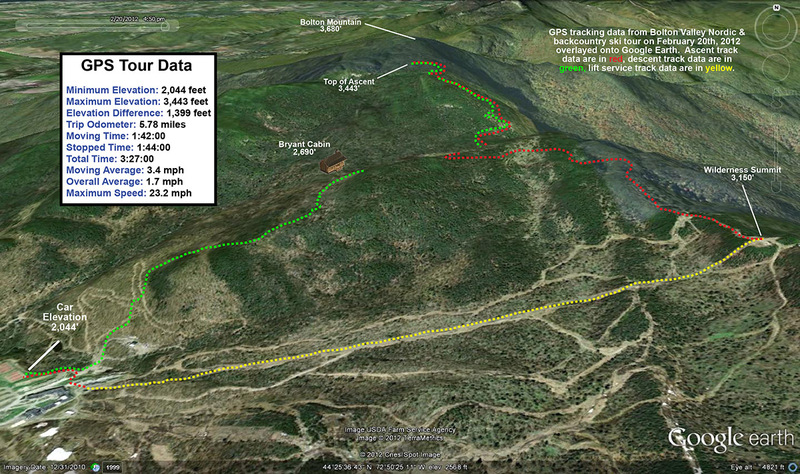 Checking the GPS at the car, it reported a tour length of 4.35 miles, with an overall elevation difference of 1,112’. It was certainly the boys’ biggest tour to date, and they continued to have energy at the end because they were quickly playing on top of the snowbanks in the parking lot while E and I packed up the gear. E said that she had a great time with her first trip on Heavenly Highway and the Catamount Trail beyond Bryant Cabin, and we saw plenty of opportunities for more exploration. 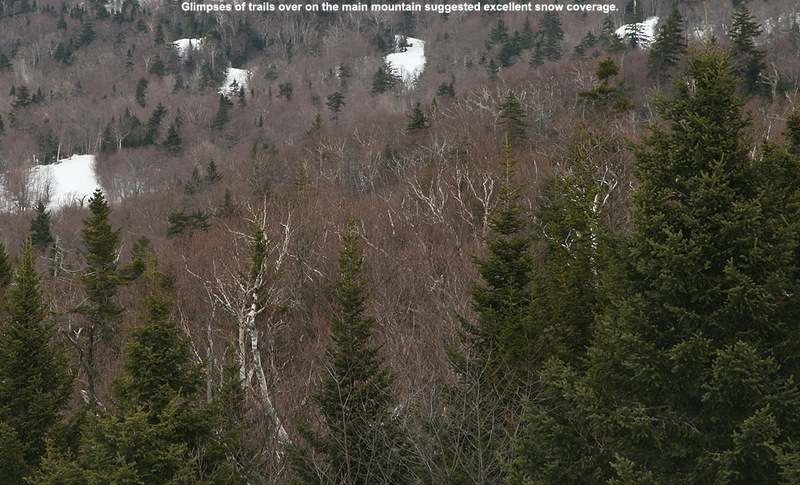 Hopefully next time we can get even softer conditions and nail the route through those lower glades. 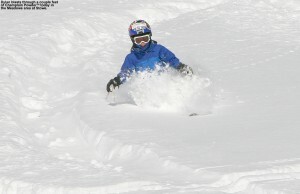 As Ty demonstrates, the Outlaw Glades were really delivering the goods today at Bolton Valley. 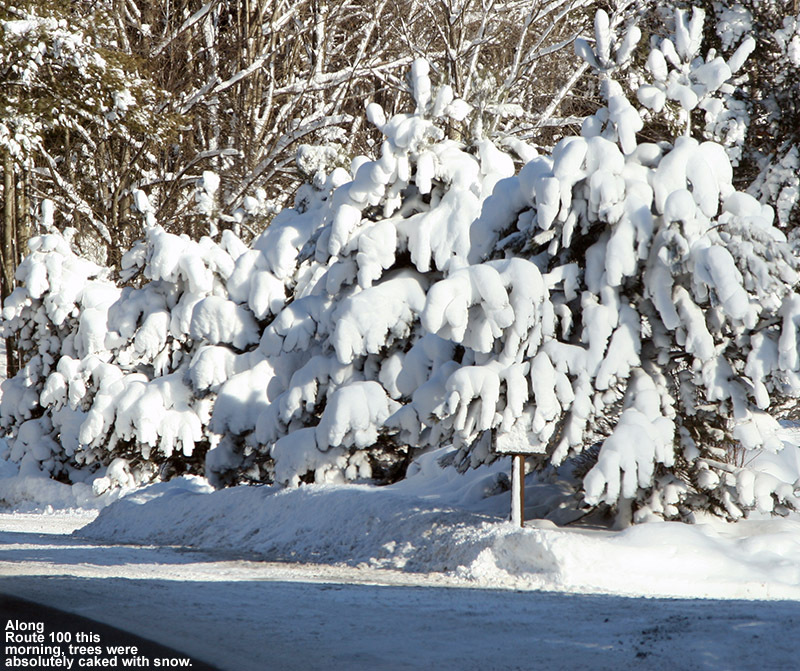 For much of January the weather pattern in Northern Vermont featured winter storms with mixed precipitation. 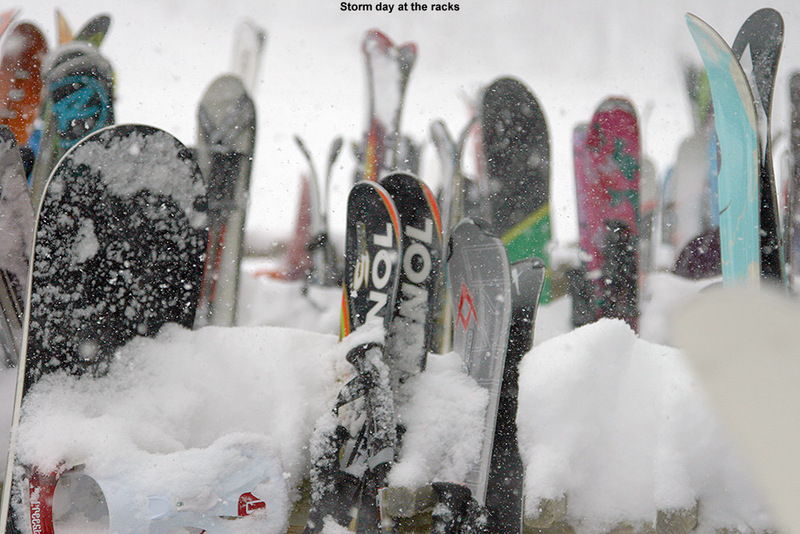 The storms weren’t actually that bad in terms of how they affected the ski conditions, but with the mixed precipitation robbing some of the potential snowfall, they just didn’t have that oomph of full-blown winter storms. So naturally everyone was excited when February rolled around and the weather pattern appeared to be undergoing a change. The only problem was… it was a change to essentially no storms at all. That’s good for a few days to perhaps a week if it comes with good snow preservation, but soon the powder gets harder to find, and the groomed snow just gets old. 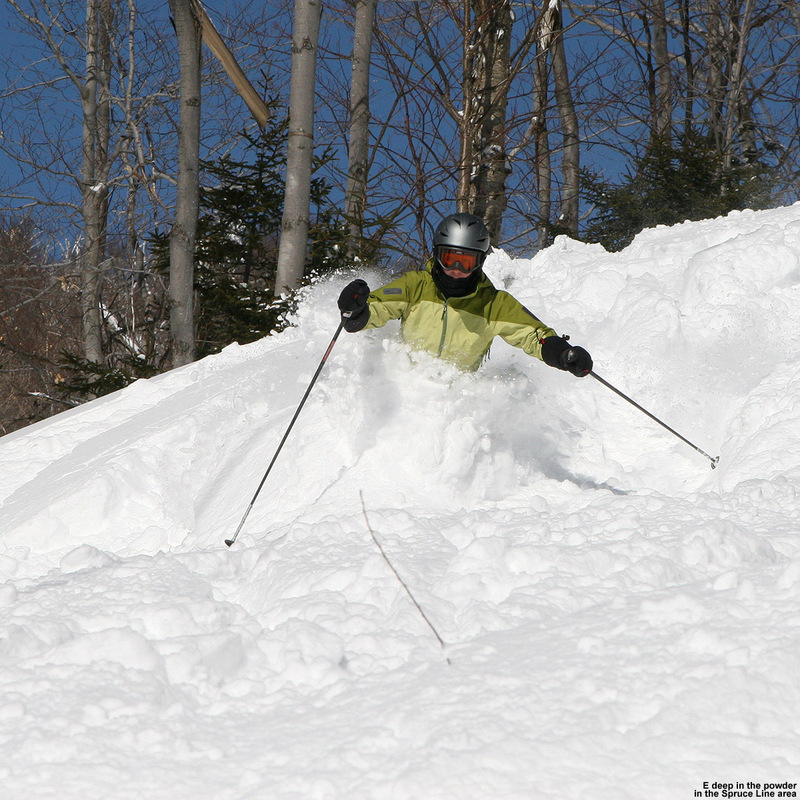 We’d hit that point by last Saturday – the quote from Stephen was that the snow was “beaten down”, and I’d say he nailed the general demeanor of the slopes perfectly. 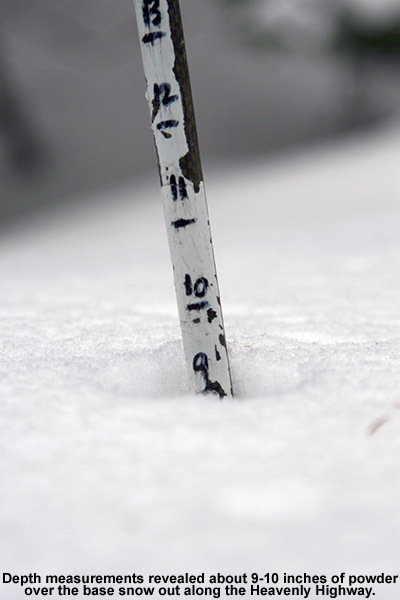 To put some numbers on it, through today (February 18th) we’ve had just 5.0 inches of snowfall at the house for the month… a month that averages roughly 45 inches of snow down here in the valley. So when we got to mid February and it looked like the weather was going to switch back to the pattern of storms with mixed precipitation like we saw in January, I think there was some relief… we probably just didn’t know how good we had it before. The storm ushering in this change started up on Thursday, and it was pretty weak on precipitation overall, but by this morning the local mountains were approaching a half foot of new snow, which was more than enough to whet our appetites for the slopes. Powderfreak has been keeping us apprised of the conditions at Stowe, and based on his powdery pictures from yesterday, we knew that the good snow was out there. Combined with a weather forecast of partly cloudy skies and temperatures in the low to mid 30s F, it was looking like a mighty fine day to hit the slopes. Bolton’s Timberline area finally opened last weekend, and although I suspected that the warmth this week was going to undermine the conditions on those lower elevation trails, we still wanted to base ourselves out of Timberline for the day due to the convenience it offers. It’s a holiday weekend, so parking in the village and dealing with the main base would likely be a bit chaotic. When we arrived at the Timberline Base (~1,500’) around mid morning today, the snow situation was actually looking a bit grim; the temperature was already in the mid 30s F and the snow surfaces looked like just a couple of inches of new snow over a refried base. I was optimistic though; I knew the higher elevations would be in much better shape, and our real goal was to get ourselves over to the main base area and up to Wilderness. Just as we were getting our gear on we saw Stephen and his crew at the base of the Timberline Quad. I inquired about the snow conditions and Stephen didn’t sound enthusiastic. I asked him if he’d been over to Wilderness yet and he said no, so I was still holding out hope. While snow surfaces did look bland at first, they quickly improved as we rode up toward the Timberline Summit (~2,500’), and all my fears were allayed by the time we got off the lift. I checked off the side of the trail and found a good 4 to 6 inches of powder there for the taking, with still more in some spots. 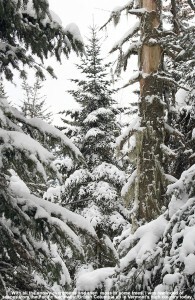 I even took a quick jaunt in the Timberline Run trees, and found the same stuff. By this point I knew we were in for some good powder skiing, and I was more than happy to share this thought with E. She was quite unimpressed with some of the off piste conditions last weekend, and her enthusiasm for today was painfully low at first. As I passed by Lower Bentley on our way to the main base, I saw some great looking powder off to the side of the trail and really wanted to dive in, but our goal was Wilderness and we had to stay on task. Stephen and his kids were all on board for a run in Snow Hole, so we hopped on the Wilderness Lift with a group plan in hand. As we ascended through the Wilderness terrain, it was quickly obvious how good the snow was going to be. 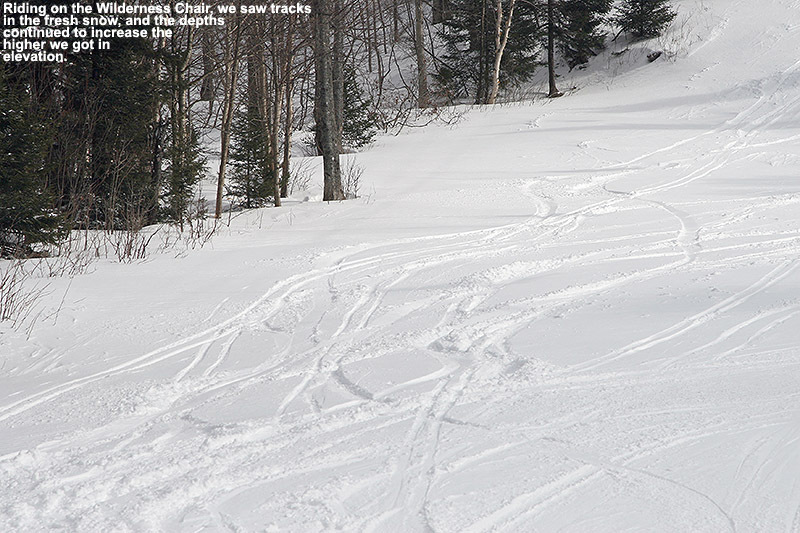 We began to see tracks in the powder on the Wilderness Lift Line, and the depths were increasing nicely. 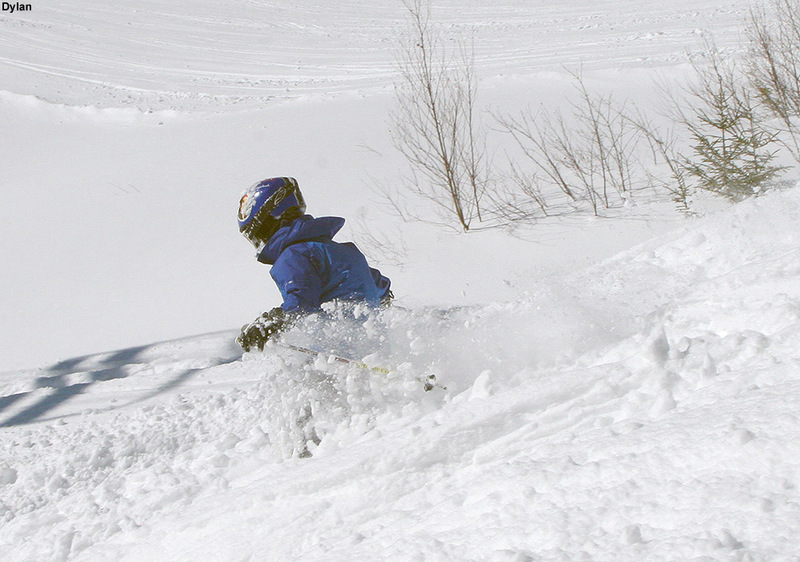 We found great snow in Snow Hole, a general 4 to 6 inches of powder outside of the high traffic areas where the snow had already been packed down. The hobblebush is sticking out a couple of feet in the big open area up top though – it could probably use a trim this off season, but it’s presence is also just a function of the low snowpack this year. Stephen, Thomas, Johannes, and Helena had to head in for lunch after that run, but E and the boys and I went up for another Wilderness run to hit Bolton Outlaw and its surroundings. Bolton Outlaw had seen enough traffic that it unfortunately held a lot of slick areas, but the glades around it were fantastic. 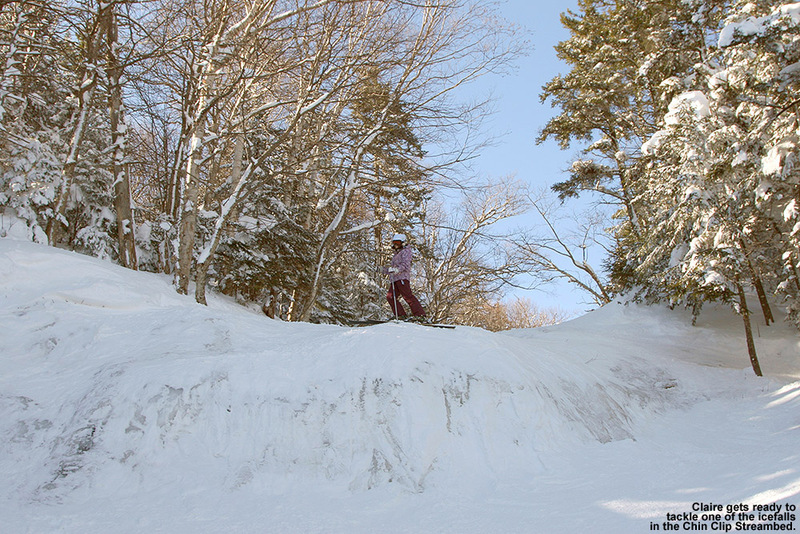 The boys ripped up some of the fresh lines in there and the snow quality had everyone excited. We poked around in some lower elevation glades as we descended back to the base, with some decent turns, but nothing quite up to the level of those Outlaw Glades. The Wilderness Lift Line provided some nice turns though, consistent with the quality-looking snow we’d seen from the lift. 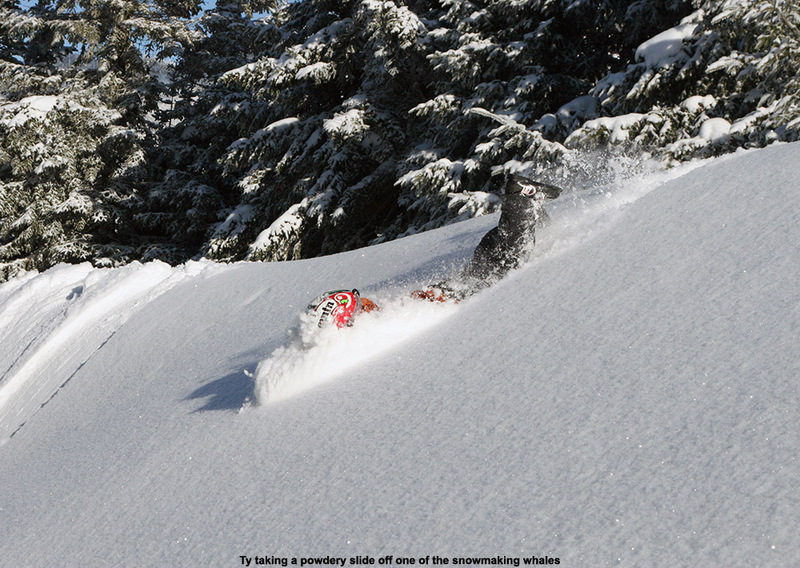 Dylan enjoys some of that powder in the Outlaw Glades. The boys were already talking about lunch by the time we got back to the base, and we headed into the lodge with a plan to go to the James Moore Tavern. Stephen and his group were ready to head back out onto the slopes, and had to leave by 1:00 P.M., but Ty and Dylan were just too hungry to be talked away from lunch. The lodge was really hopping though with holiday business; we even had to wait about 10 minutes to get into the Tavern. With the wait we had plenty of time to hang our ski stuff in the clothing area, and we made an impressive and compact assembly of all our gear, even the helmets. Lunch was a fun time; we sat next to a mom and her toddler, who kept everyone entertained for the entire meal. 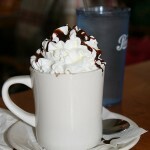 The boys got some impressive-looking hot chocolates to start things off, and for me, lunch was an easy choice. 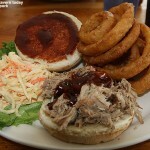 As soon as we entered the tavern I smelled that barbeque smell from the pulled pork sandwich, and my mind was immediately made up. I’ve had it before, but this one was especially good. 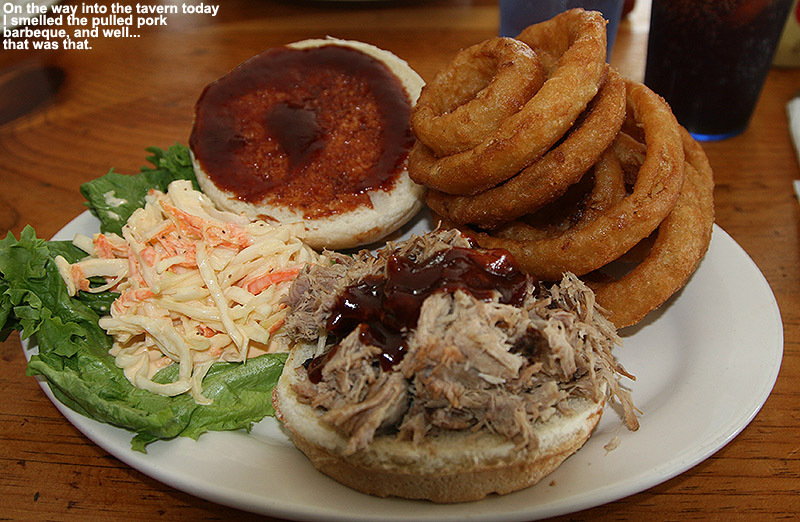 I knew I was going with pulled pork as soon as I walked into the Tavern today. We headed back out to the slopes after our filling lunch, and Wilderness was all we had on our minds; there was no lift queue, the snow was fantastic, and there was powder to ski. Based on what we’d heard from Stephen about the Vista area, there was no need to go anywhere else. We ran the same couple of runs that we’d hit earlier, and powder pickings were a little slimmer, but the snow was still quite good. We did notice that areas of powder in the sun below about 2,500’ were getting a little thick, so presumably the freezing line was creeping up a bit in elevation. Those Outlaw Glades were again the standout of the afternoon, and E said that she had her best Telemark turns of the day in there. We eventually decided to call it a day and headed over to Snowflake to get us back to Timberline. We were actually thinking of doing an extra run off Snowflake, but there was a lift queue of a few minutes so we just decided to skip that plan. A nice bonus on the trip back to Timberline though was Lower Tattle Tale. 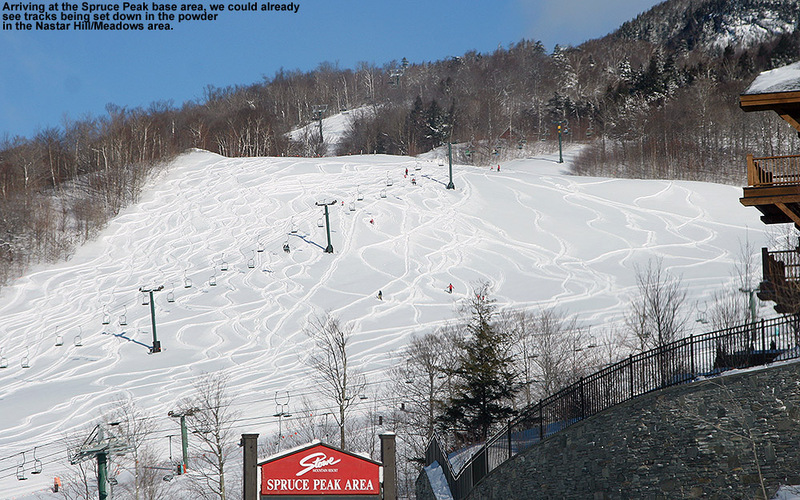 For whatever reason, people had not been skiing it from the middle entrance, and the skier’s left held lots of powder. 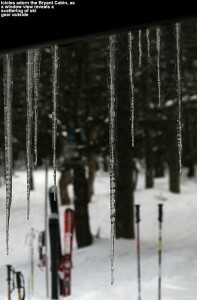 I thought it might be too low in elevation to hold onto such good soft snow, but it was more than fine, it was sweet! Judging by what we found on the trip back to the Timberline Base, I’d say that around 2,000’ was the elevation at which the powder really started to peter out. 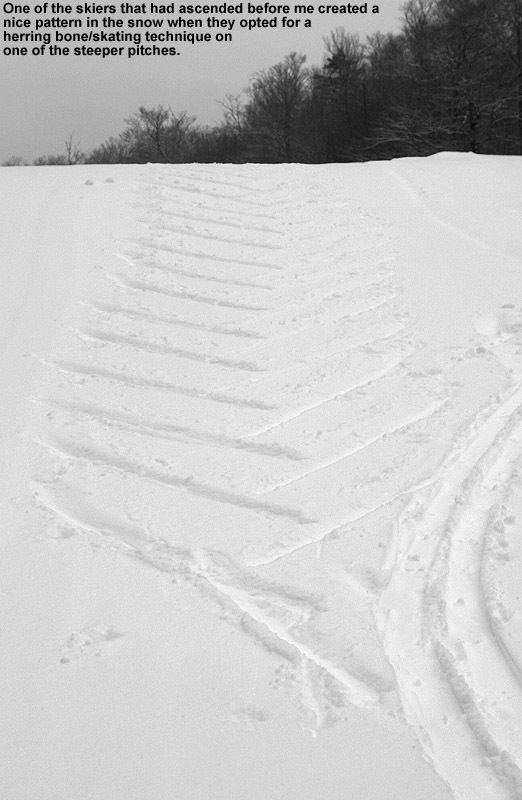 The groomed trails began to get slick as well, so below that elevation was where temperatures must have gotten just a bit too far above freezing over the past couple of days. Although temperatures had definitely stayed below freezing on the upper mountain, it was still above freezing when we got back to the car, so the lower elevation snow at Timberline will probably do a bit of temperature cycling tonight. It seems like everything above 2,000’ is going to continue to be mighty fine though, so all the holiday visitors should keep on getting those good turns. Based on the fantastic conditions we saw up high on Wilderness, we’re thinking of going for some backcountry skiing tomorrow – it looks like another comfortable midwinter day with sunshine, so there should be some opportunities for excellent earned turns. 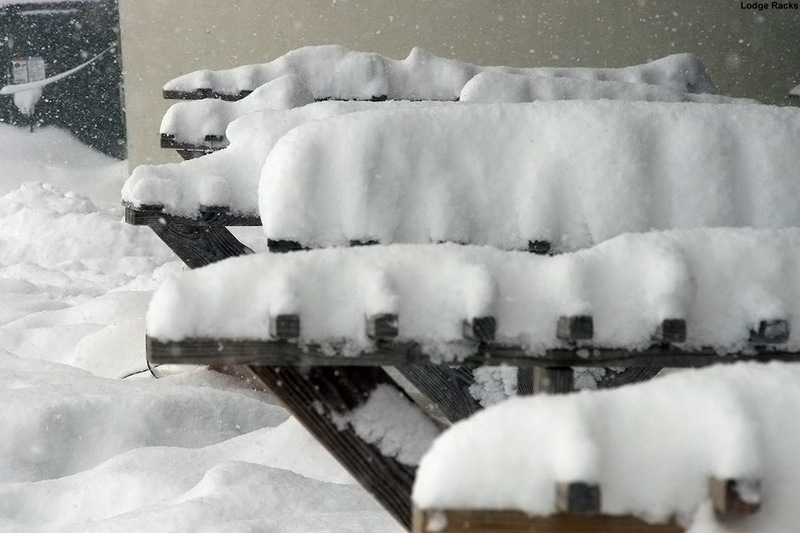 We may also get a couple more of those mixed precipitation storms in the coming week, and even if they’re not perfect, at least they’ll keep the slopes fresh – and we’re going to appreciate that as much as we can. There’s been sufficient coverage for skiing at Bolton Valley’s Timberline area since at least mid January, and I made my first turns of the season there on January 15th, but apparently the resort hasn’t been confident in the ability of the snow to hold up to much skier traffic, because it wasn’t until yesterday that they started running the Timberline Quad. It’s incredible to think that we’ve had such a late start to Timberline lift-serviced skiing, and similar things may have happened before, but certainly not in the past several seasons since we’ve been back from Montana. At this point though, it’s just really nice to have the expansion to spread everyone out and open up some of our favorite terrain, so we were excited to get in on this first weekend day of Timberline lift service. There’s the potential for cold temperatures and even some fresh snow as we move through the weekend, but today it was sunshine with temperatures in the 20s F. We didn’t get up to the mountain until roughly 11:00 A.M., but the number of visitors was pretty light and parking spots were open right in the circle below the Timberline Lodge. 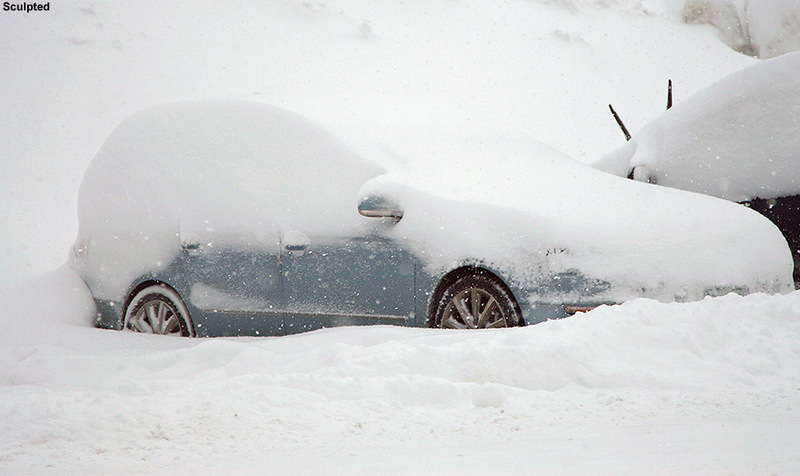 The parking was so easy that after dropping off E and the boys and all our gear at the, I parked the car and then walked over and began chatting with them – forgetting to even put on my ski boots. 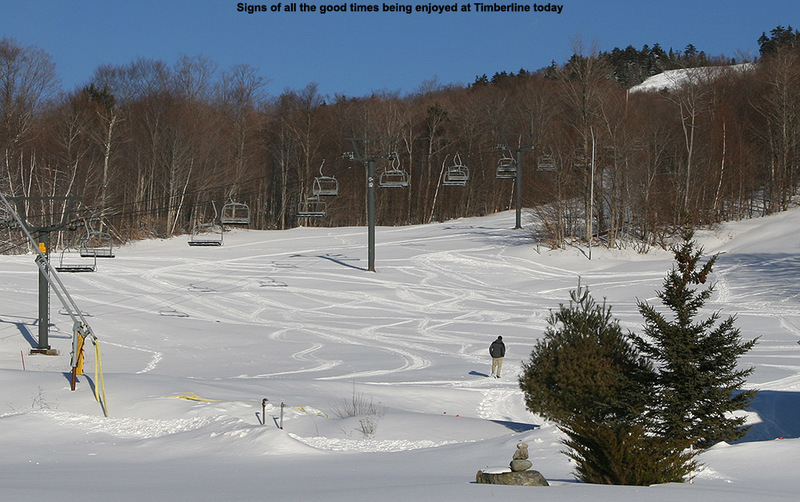 We’re definitely still getting into our Timberline rhythm for the season. We kicked off the day with a trip down Villager to Sure Shot, and then took the link onto Lower Tattle Tale to hopefully get into some powder. Pickings were a little slim since we haven’t had fresh snow in a week, but some lines were still available and we shot some pictures of the boys getting into the untracked snow. 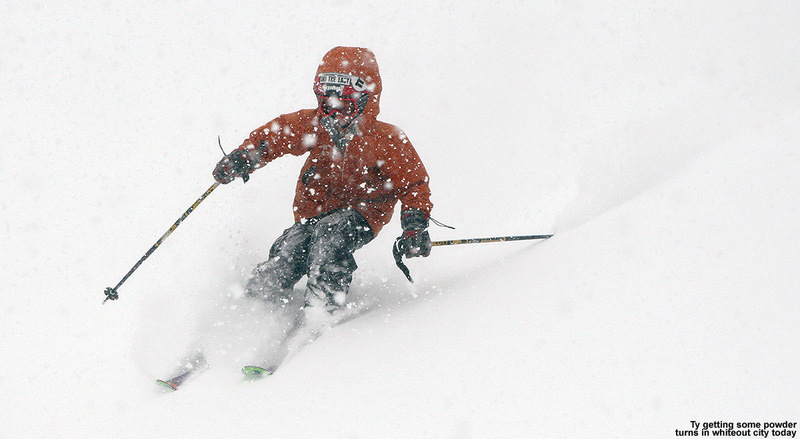 The powder was getting a touch stale after a week, but we weren’t complaining. We jumped on Spur to get into some additional untracked snow on our trip back to the base, and then headed up again for a mid station run. 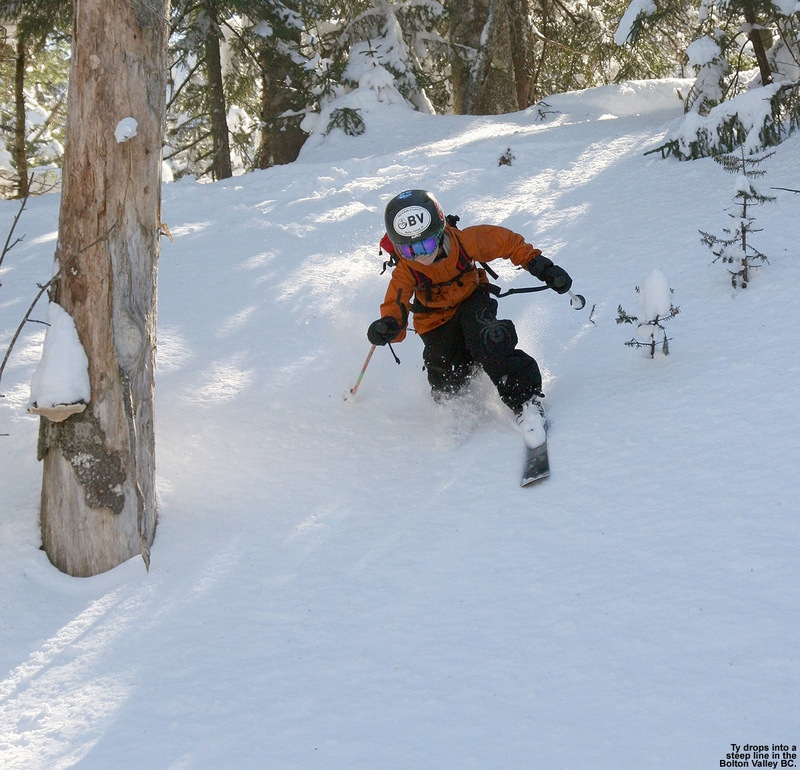 We took Wood’s Hole and worked our way down to check out the Corner Pocket Glades for the first time this season. 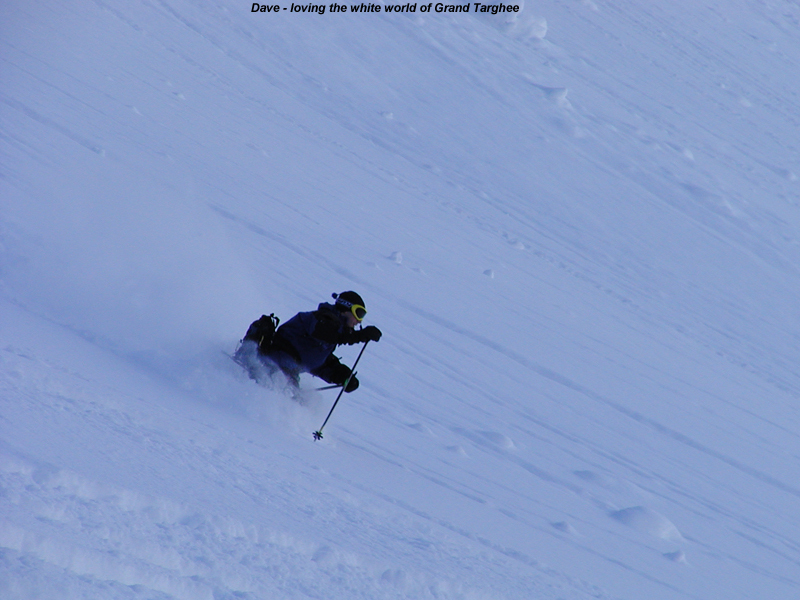 Coverage was more than sufficient, but the tracks of previous skiers combined with a mixture of shaded and sunny areas really produced a lot of variability in the powder and even the subsurface. The challenging conditions had us quickly getting back out on Spell Binder, where surfaces were much more consistent. E cruises along in some of the powder on Lower Tattle Tale. The boys were already urging us to get lunch, so we hit the Timberline Lodge for a break. The boys wanted to order from the grill, so Ty got a cheeseburger and fries, and Dylan went with chicken fingers and fries; it was a good thing too, because I overcooked today’s tomato soup and it was tasting rather smoky. On a positive note though, our replacement Stanley® “bullet” vacuum bottle recently arrived, so we had a chance to test it out and it was keeping the soup incredibly hot. Our other Stanley bullet that we’d had for several years had ceased to insulate (it probably had lost its vacuum), and indeed Stanley stands behind their lifetime warranty. I called Stanley up, informed them about the loss of insulation in our bottle, answered a few questions, and said a new unit was on the way. So, if there are others out that use any sort of Stanley insulating equipment for their ski outings, (or are thinking of getting one) know that the company is quite serious about that lifetime warranty. On our way back out to the slopes after lunch, we gave Stephen a call and planned to meet up. While we waited for him we basically repeated our first run from the day, but mixed in some Sure Shot Trees for variety. We eventually met up with Stephen and Thomas and did that route yet again, but Stephen got spun around and had a fall on Sure Shot, so he didn’t join us for the powder on Lower Tattle Tale. 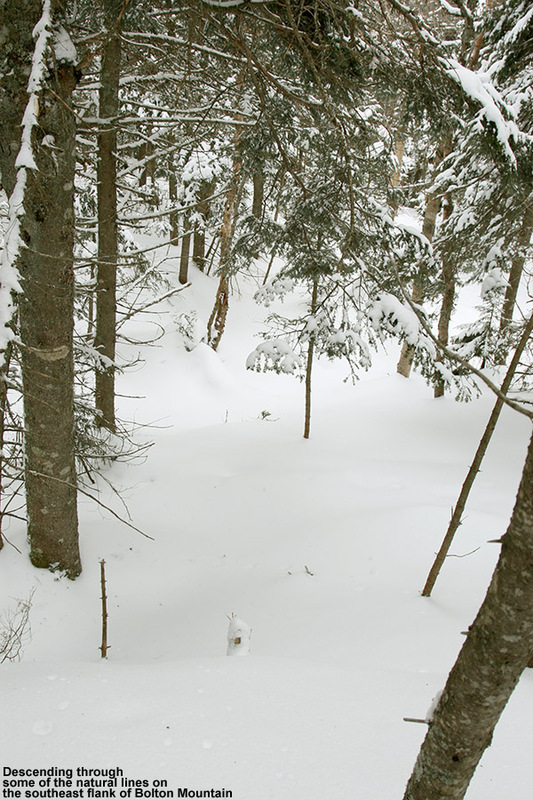 We peeked into the KP Glades, and they looked awesome, but we didn’t get a chance to head in. We were done after that trip and headed home, but it had definitely been a good day on the slopes of Bolton Valley despite the recent lack of snowfall. 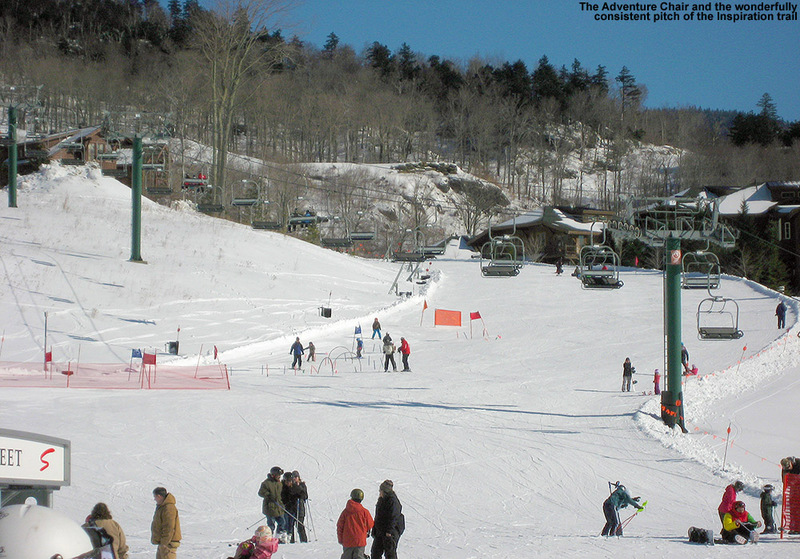 It doesn’t look like we’ll be at Stowe tomorrow, as E and Claire are canceling BJAMS ski program due to the expected combination of temperatures and wind; temperatures aren’t going to get out of the single digits, and wind chill values are going to be in the -40 F range. I think we’ll all be happy enjoying the day inside tomorrow. 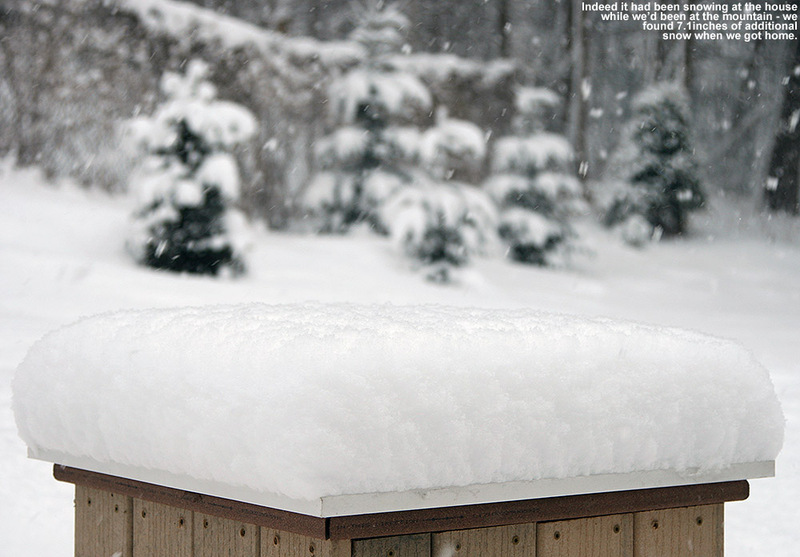 Our first winter storm of February continued the good timing for weekend skiing by starting up for us on Friday, and we’d already picked up an inch of fluffy Champlain Powder™ at the house by Friday morning when I made my 6:00 A.M. CoCoRaHS observations. By yesterday morning we’d passed three inches of accumulation at the house, and the local mountains had reach a half foot of new powder, so things were looking good for the slopes. 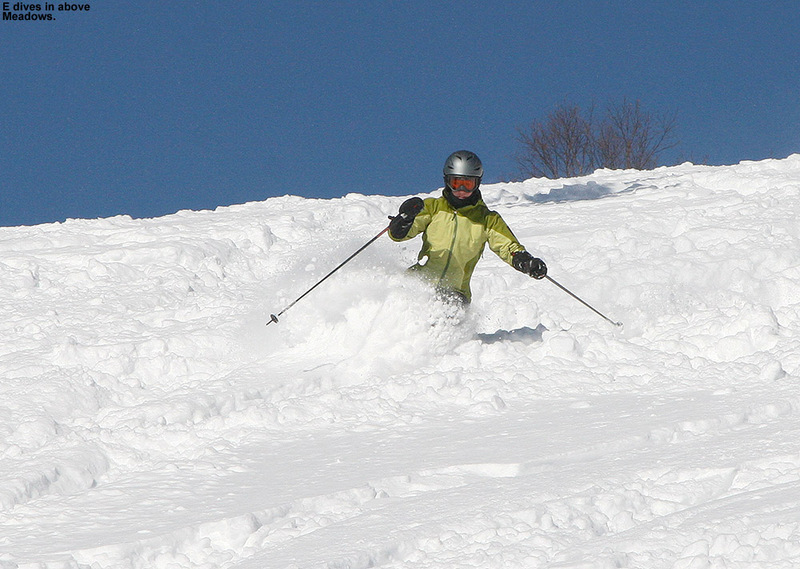 Indeed we skied some fantastic powder conditions yesterday at Bolton Valley, especially when we headed over to the Timberline area. This afternoon it was back to Stowe for turns, and much like yesterday, the morning low temperatures were cold at around zero F. Fortunately, the forecast called for highs in the 20s F with clear skies, so we were looking forward to getting into some of the recent fresh snow. 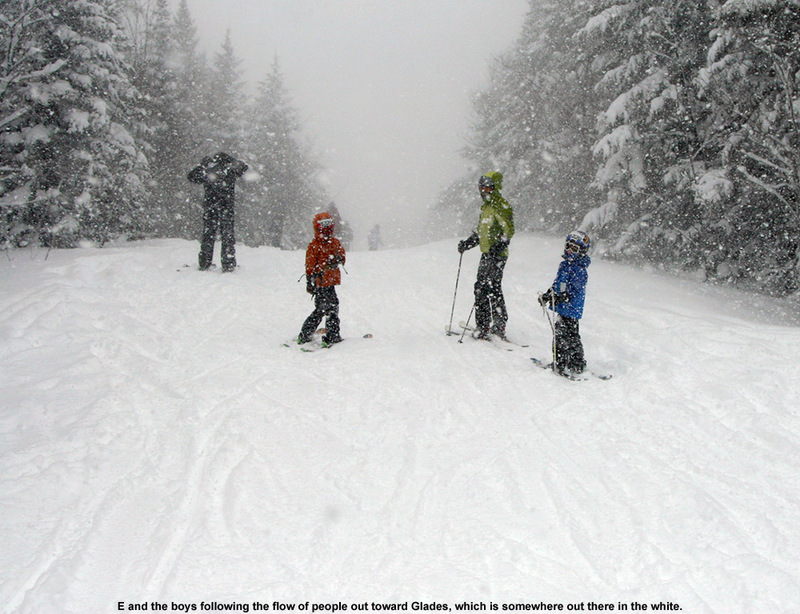 Today is Super Bowl Sunday as well, and that can help to keep crowds lower as many people stay off the slopes to participate in parties. We headed to the resort around midday, and the boys and I hooked up with Luke and Jack and got in a quick Alpine Double run on the open terrain above Meadows while we waited to see if Alexia was going to join the group. 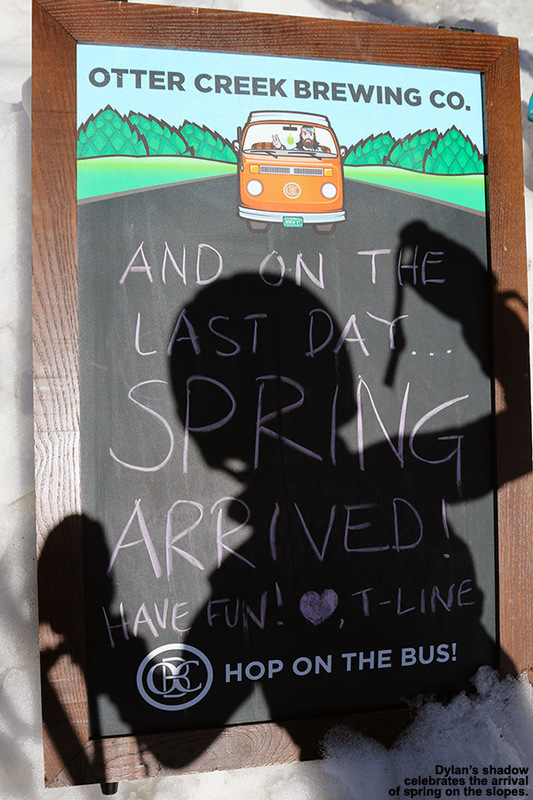 I’d put the snow conditions that we encountered somewhere in the good to great range; skier traffic is all that kept it from being as outstanding as what we skied at Timberline yesterday. Back at the base area, we still had no word on Alexia, so we did another lap and jumped into the trees to the skier’s left of the lift line. There were no tracks in there at all, so the powder skiing was excellent. After that lap we were finally able to meet up with Alexia, who was with her brother Jordan, their parents, and Claire. We all got together as a large group and took Sunny Spruce over to Sensation. Like last week, we saw plenty of great snow on Spruce Line, so those of the group that were feeling up for it took a run in there, mixed in with turns on Main Street. 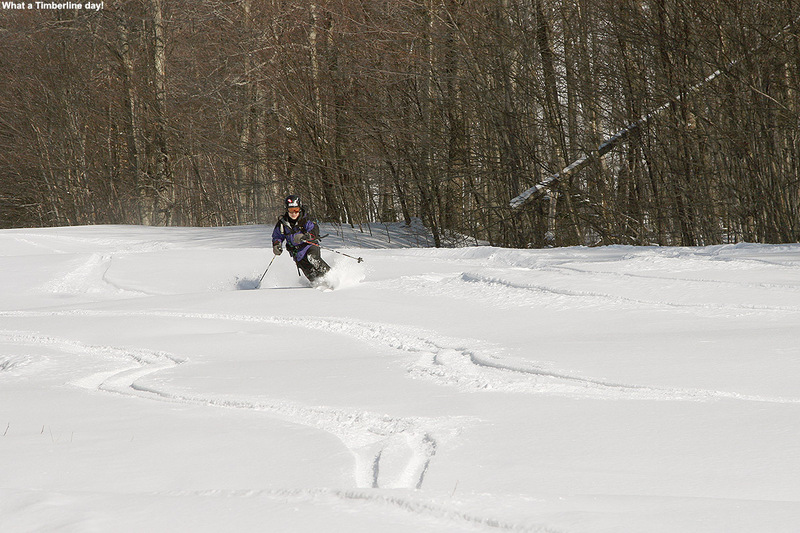 We also found a good access point to the final pitch of the Sensation Lift Line and caught first tracks though there. 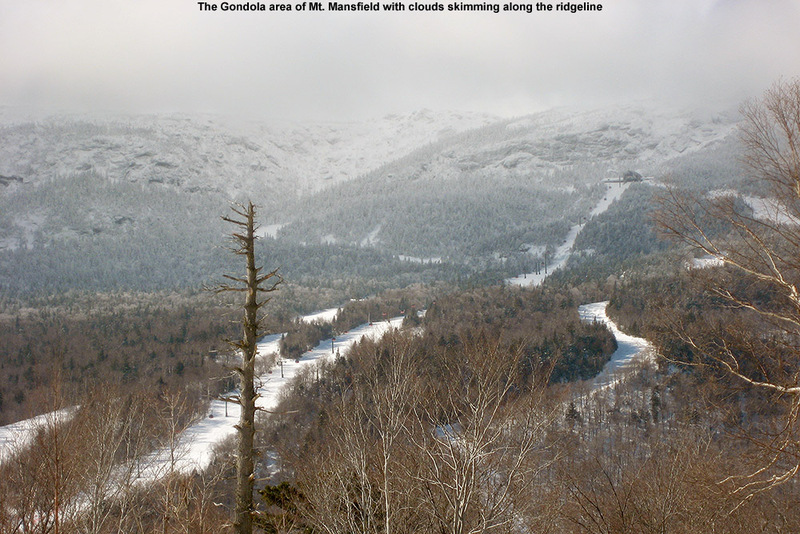 Our next Sensation run brought us over to Upper Smuggler’s for some steep turns, and we returned to the Spruce Peak Base to work our way over to the Mansfield side of the resort. We spent the second half of the afternoon over there on the big mountain, starting off with a run of Perry Merrill/Rim Rock/Switchback and some of the associated trees. We followed that up with a similar start, but worked our way over to High Road and tried out some lines in the trees down to Rim Rock that we’d never seen before. We found plenty of nice snow in there, which isn’t surprising with the combination of elevation and protection from the sun and wind that the area offers. The trees are mostly evergreens in there, and all that really needs to be done to create some nice additional lines is to trim off a lot of dead branches on the lower limbs. After that enjoyable variation, we worked our way back across Gondolier to hit some more of the Switchback trees, and then the boys finished off the day with a couple of their requisite runs in the little terrain park off Midway. A number of folks were up for après ski at the resort again today, and this time people gathered in the Spruce Camp Bar area to cap off the great weekend on the slopes. 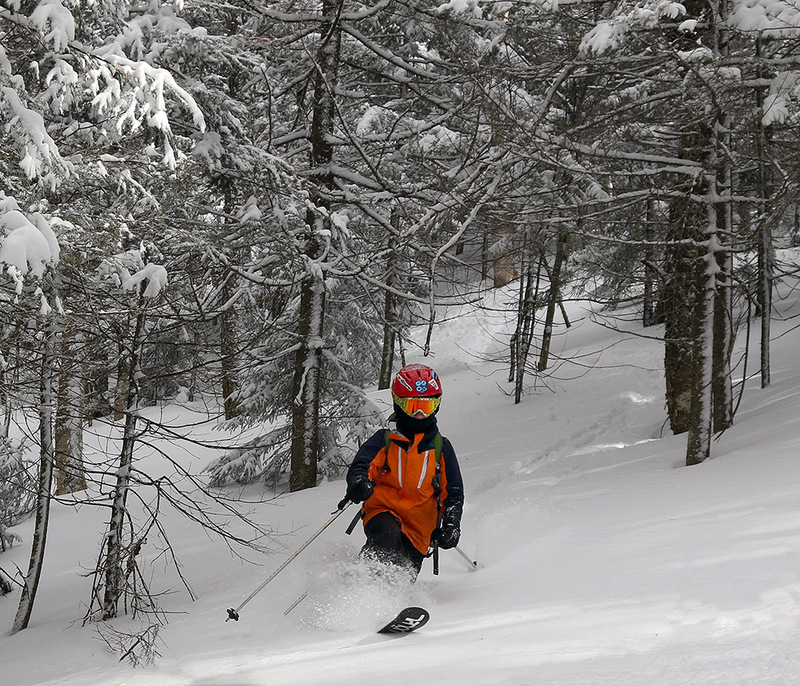 We’re in the heart of winter now, and although snowfall hasn’t been as prodigious as usual this season, the constant snowfall is adding up and the local backcountry is skiing well. 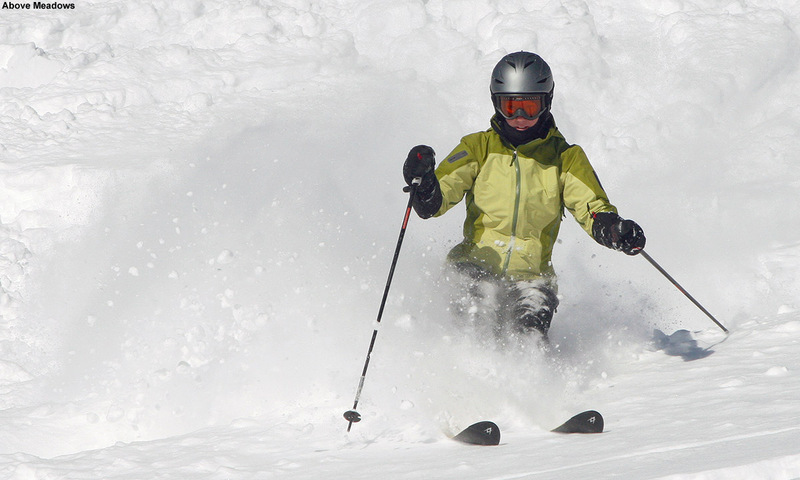 The skiing has definitely been good both on and off piste at the resorts over the past couple of weeks, and we’re thankful for that because it looks as though the immediate future will provide only minimal additions to what we’ve currently got down on the slopes. 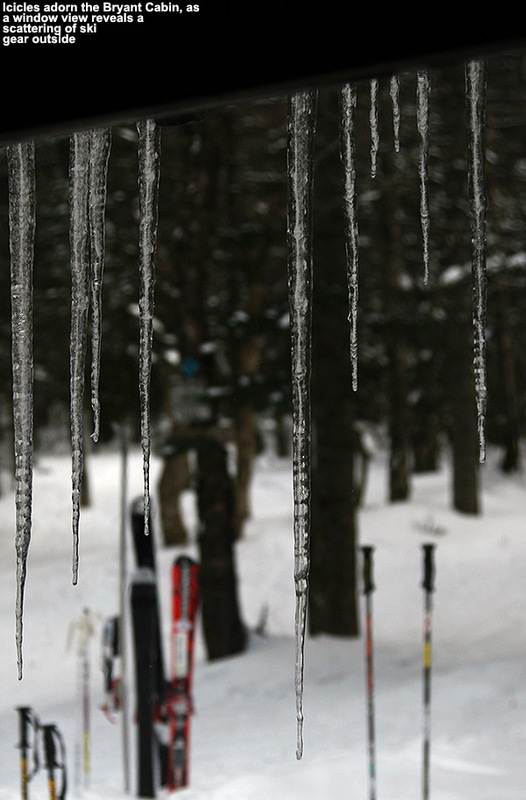 The forecast suggests that a fairly quiet week of weather is coming for Northern Vermont, with just a couple of minor snow events. There’s one round of snow expected to come through tomorrow night into Tuesday, and then another one expected for Friday. If these storms do their usual thing with the mountains, it should work out just fine since there don’t appear to be any major warm air intrusions on the horizon. It would be nice to have the new snow go right into enhancement instead of recovery from firm conditions due to mixed precipitation events, which seemed to be the pattern in much of January. The scuttlebutt I hear from some of the meteorologists is that we have undergone a significant weather pattern change (I guess the lack of any mixed precipitation in the forecast this week is a testament to that), which will only offer minor events for now, but does hold the potential for some bigger systems down the road. 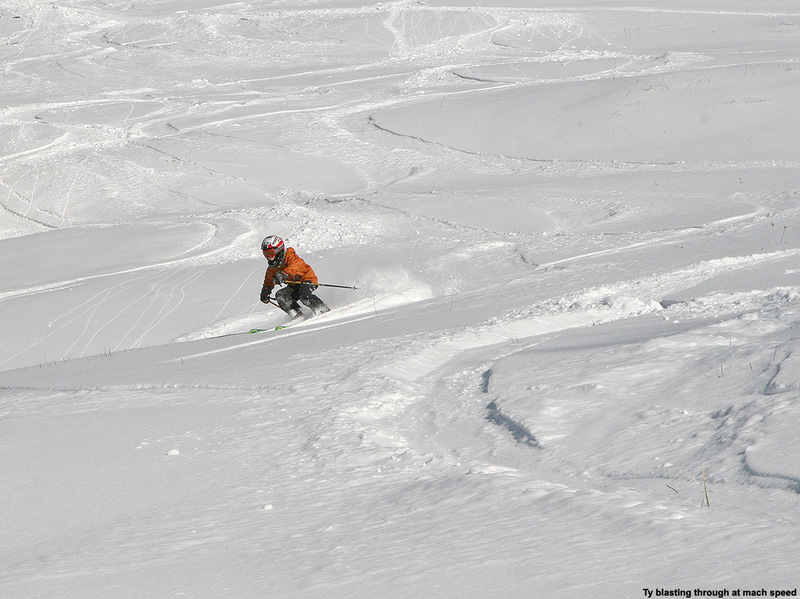 The base (both snow and skier) is definitely ready for some bigger dumps, and it would be nice to build it for spring. 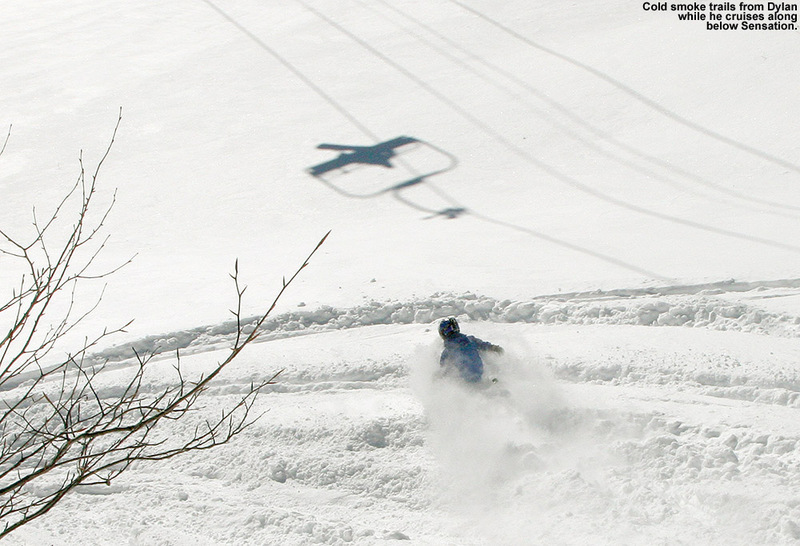 We’ll see what Mother Nature offers in the coming month to set up the rest of the season. 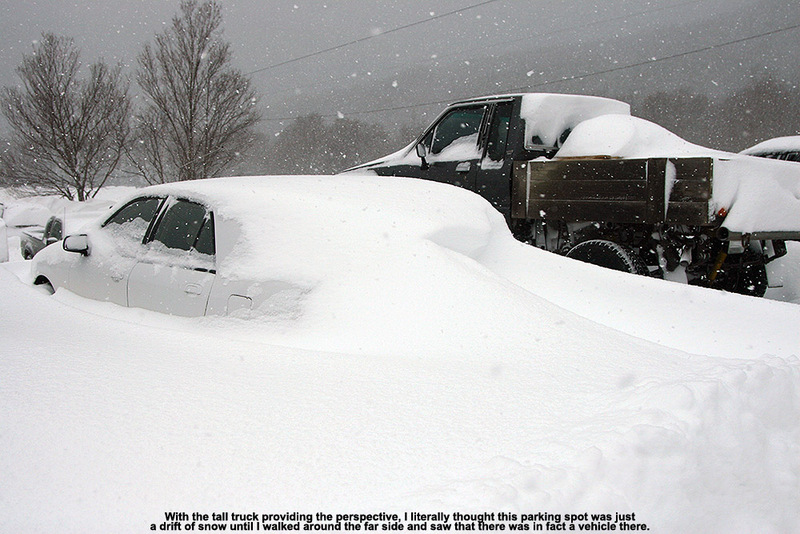 If it seemed like we had a lot of mixed precipitation events in Northern Vermont this January… that’s because we did. 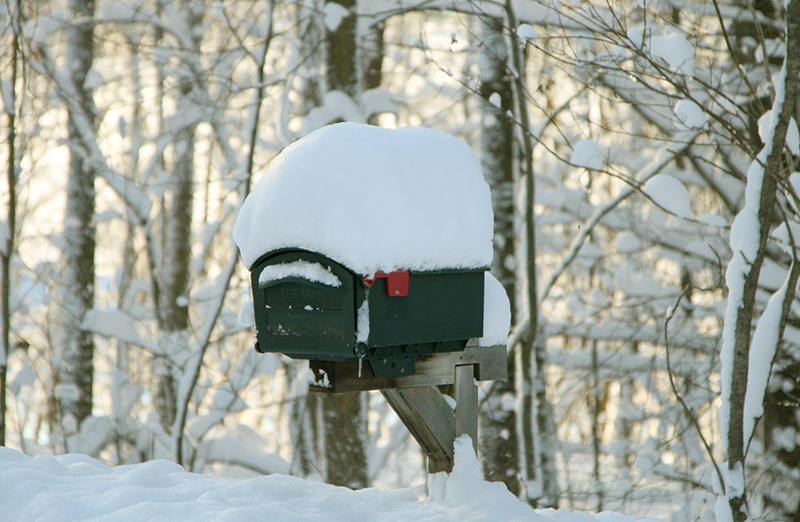 Many winter seasons will have some sort of January thaw, where the weather pattern shifts or resets and the temperature temporarily bumps above freezing, but according to Roger Hill, this year we had seven January thaws. None of these storms posed snow coverage issues for the local mountains; they were just winter storms with snow on the front and back ends, but warm temperatures with mixed precipitation in the middle. But even though they weren’t notable thaws for the mountains, each time the precipitation changed over to something other than snow, that was snow we weren’t stockpiling into the base depths for the season. 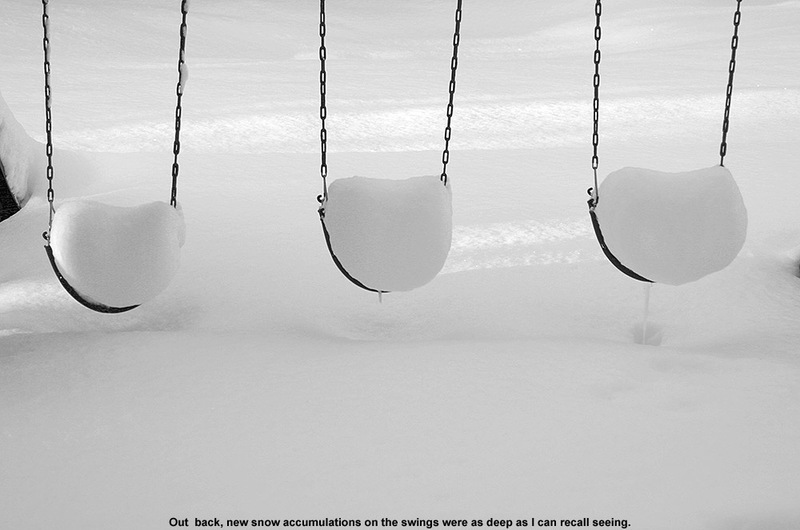 The mixed precipitation was substantiating the total liquid equivalent in the snowpack, but once temperatures came back down after warming, the potential for hard snow surfaces arose. Fortunately, the Northern Greens worked their magic, pulling out enough snow on the back end of each storm to provide a decent shot of powder to get things back to normal. 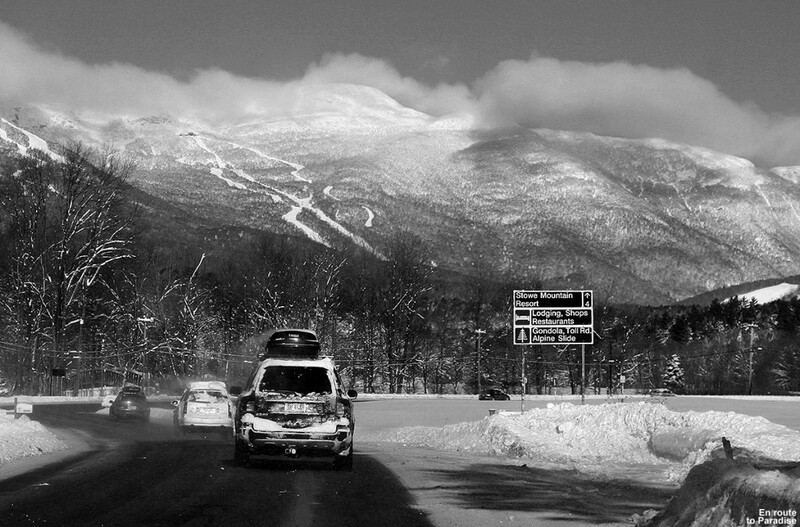 Last weekend at Stowe was a perfect example; we didn’t think the skiing was going to be any good, but Mt. 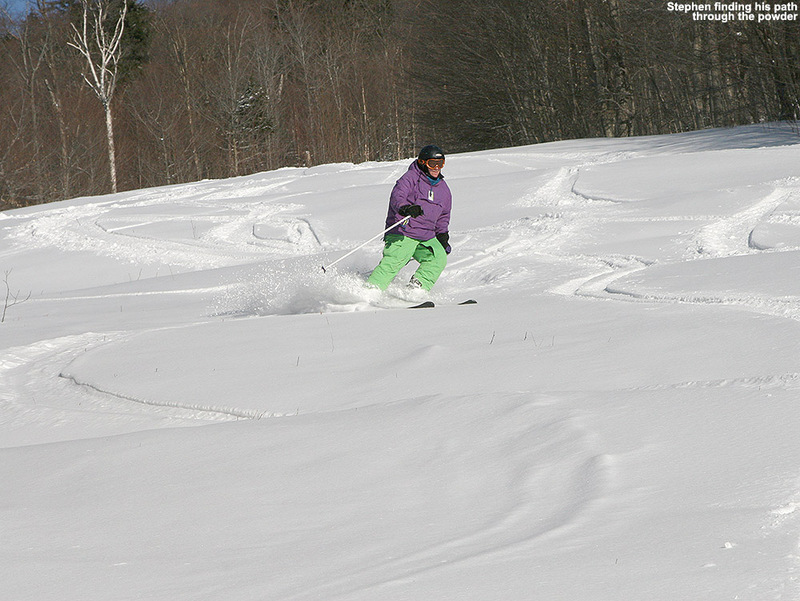 Mansfield pulled that Champlain Powder™ out of the sky, and we found ourselves making fluffy laps off the Sensation Quad on Sunday afternoon. Our latest mixed precipitation event came through during the Tuesday through Thursday period this week; snow started up on Tuesday, warmer precipitation mixed in on Wednesday, and then everything was back to snow on Thursday. 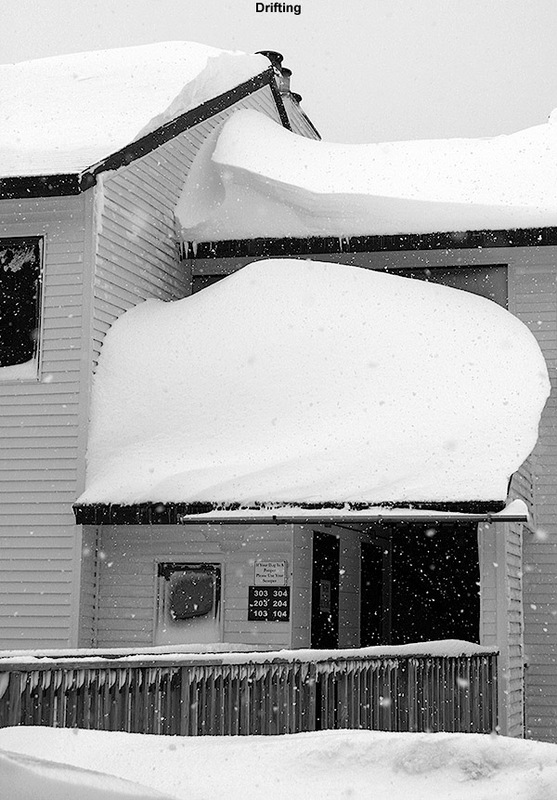 There wasn’t much snow on the back end of that event, but sure enough, another system came through yesterday and today that dropped another half foot of powder in the mountains. Over at Americanwx.com, Powderfreak posted text and pictures about the skiing at Stowe yesterday, so it looked like we were back in business in terms of powder skiing. I was feeling down with a touch of stomach flu this morning, but we decided to head up to Bolton for some turns in the afternoon because the day was looking just too fantastic to miss. 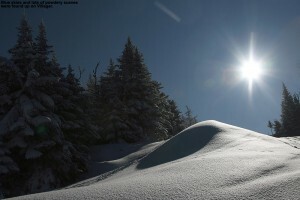 There was bright sunshine, temperatures in the upper 20s F, and fresh snow to boot. When Stephen called us around mid morning today, we let him know we’d be up to the mountain later, and that we were planning on making a special run for some extra fresh tracks. With the Timberline Quad still not running, we decided to spot a car down there and catch a nice long run of powder from the Timberline Summit. We let Stephen know about our plan, and with both Johannes and Helena in full day ski programs/lessons, he was totally free to join us. 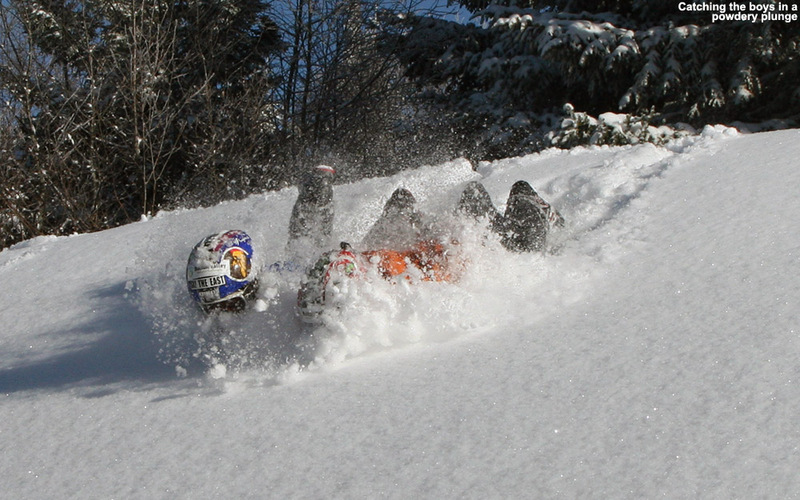 Since we didn’t head up to the mountain last Saturday, we were eager to catch up with him and make some turns. We parked a car at the Timberline Base, noticing about a half dozen other vehicles that were also there from people doing the same thing or earning turns, then dropped of our skis at the Village Circle and got a parking spot in the main Village lots. The lots were pretty full, but since it was around 1:00 P.M., spots were opening up we were able to get one down near the recreation center. E and I changed into our ski boots at the car, and the combination of sunshine and warm air was so mellifluous we could have just spent the entire afternoon right there. We rang Stephen, who said he was just getting off the top of Wilderness and would meet us at the base. 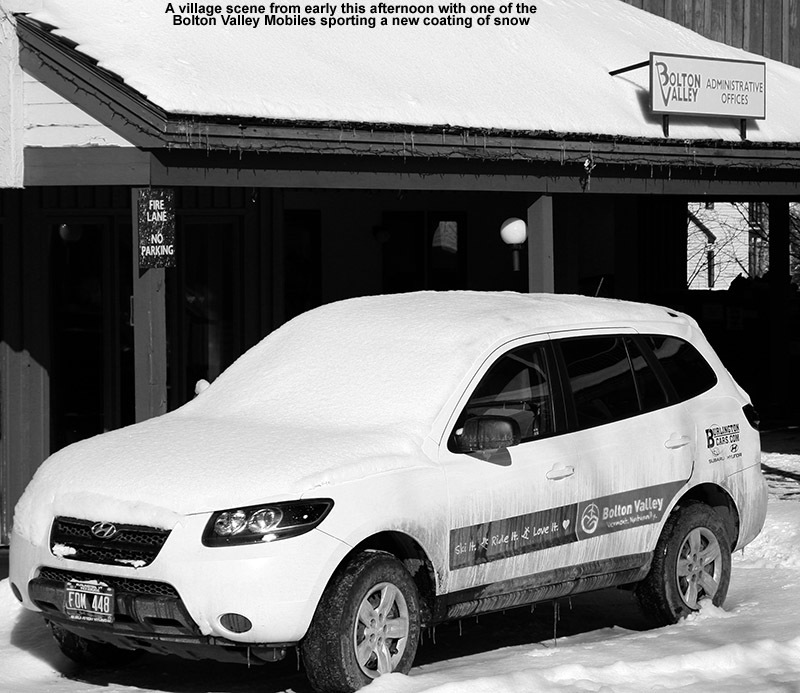 A coating of snow covers one of the resort’s vehicles in the village circle this afternoon. Ty wanted to do a warm up run on Snowflake, so we did, with a run through the Butterscotch Terrain Park as the boys often request. There was powder available off to the skier’s right as usual, so Stephen, E and I naturally availed ourselves of that. It was sometimes deep enough to get us floating, sometimes not, but even the subsurface was not half bad as Powderfreak had indicated; we were anticipating some very nice options over at Timberline. With the warm up run out of the way, we could move on to getting ourselves over to Timberline. We rode the Vista Quad and opted for the Cobrass route. Stephen had warned us that the top, south-facing portion of Cobrass was icy, and he was right. We had to pick out way through that, with even the normally soft skier’s right featuring little in the way of nice snow. 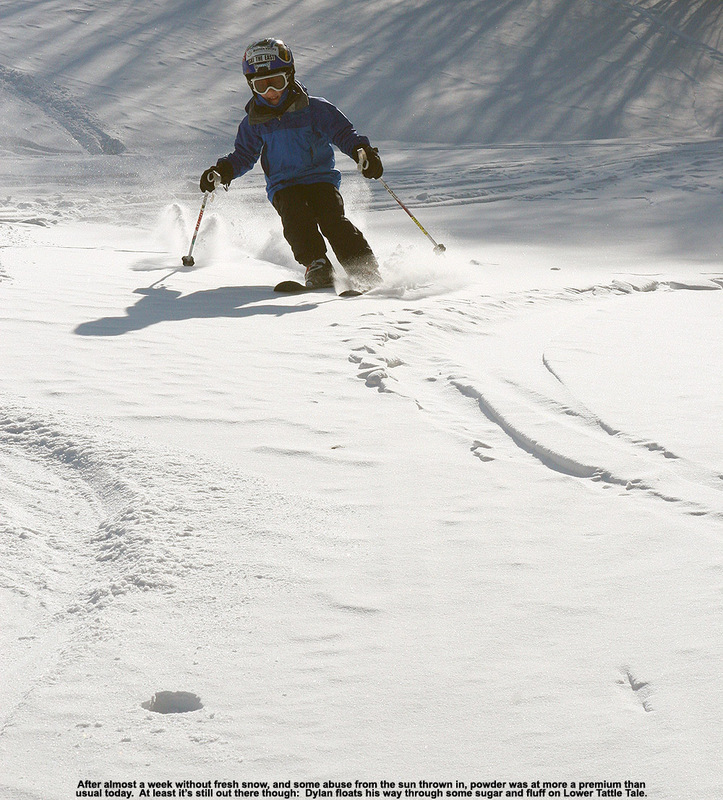 Once below that though, things improved on Cobrass Run, and improved even more once we got to Five Corners, where the skier’s right was filled with a delightful combination of powder and chowder. We discovered a layer of glorious Champlain Powder atop the snow whales on Villager. Finding ourselves at the Five Corners intersection, it was time to make our way up Villager. Although the trip up to the Timberline Summit is relatively short, E and I had our skins so that we could carry the boys’ gear more easily. I was in the process of strapping the boys’ skis to my pack, when Ty decided that he wanted to ascend with one ski on and one ski off. I warned him that it might be a bit tiring and inefficient, but he actually made it look pretty easy. The hike up Villager was glorious, with sunshine and temperatures in the 20s F just as advertised. 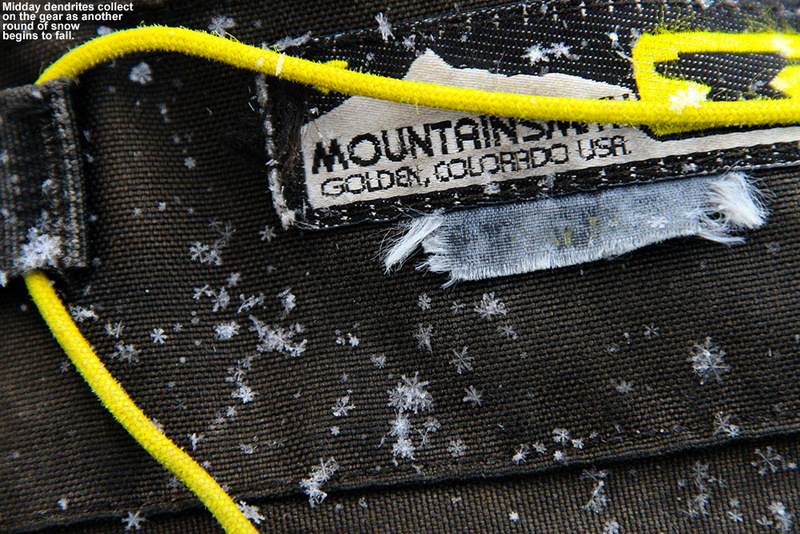 We even got the occasional sunshower of snow when a breeze would blow some of the delicate fluff out of the trees. I was excited because despite the stomach ailment that had plagued me in the morning, I was feeling just about 100%. On the hike I checked on the depths of the new snow, and throughout the ascent we generally found 5 to 7 inches of powder over the old base. 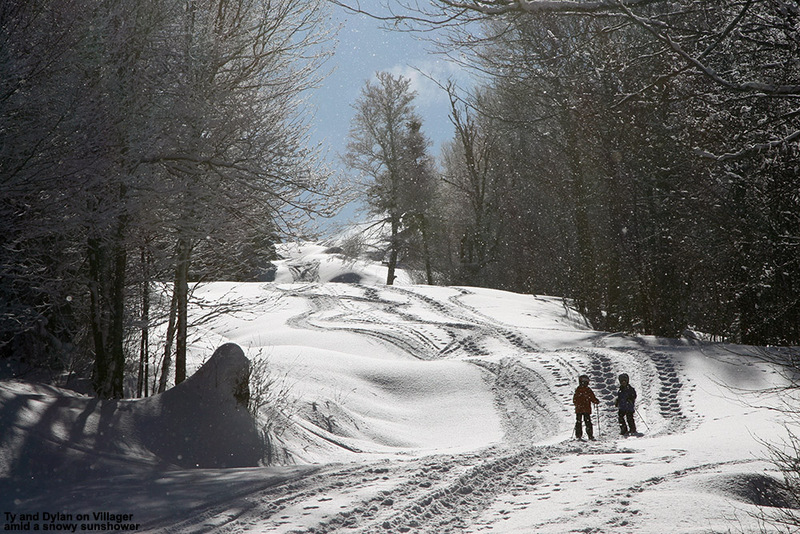 Previous rounds of snowmaking had produced some large whales up and down the trail, and now that they were coated with that beautiful blanked of fluff, the boys made good use of them for some sliding. 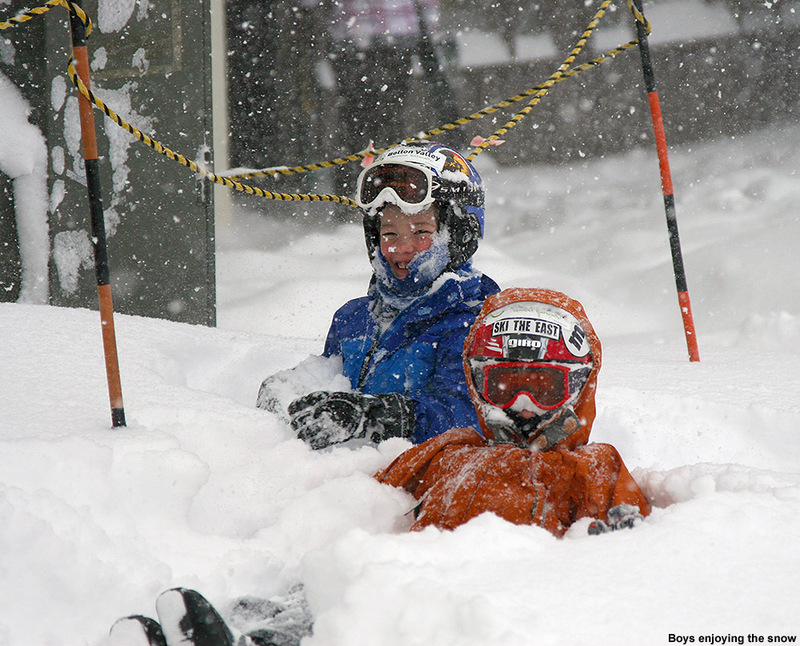 It was fun watching the powder explode around the boys as they slid off the huge mounds, knowing that we’d hopefully be skiing that same stuff soon. 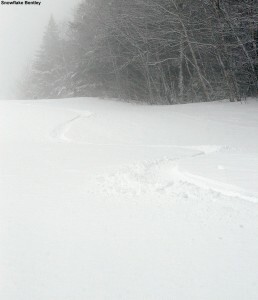 In some leeward spots, we found up to 20 inches of powder that had blown in, and the breezes that put it there must have been quite gentle because it was just as light and fluffy as the powder that hadn’t seen any wind. 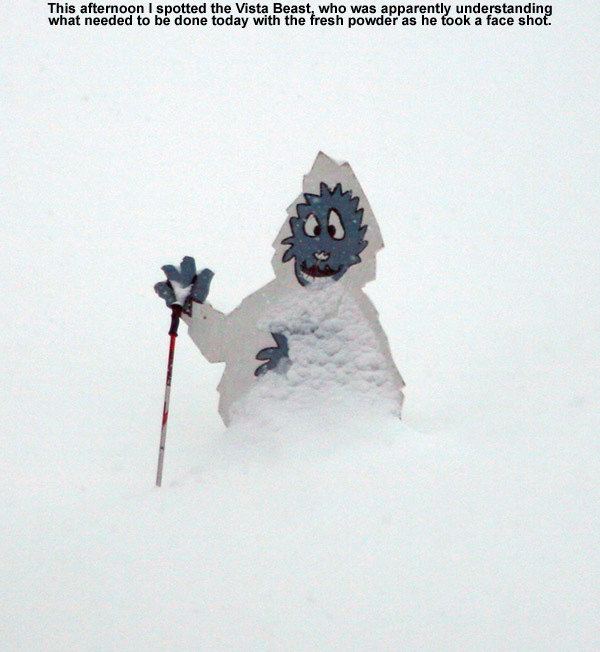 I took it as a good sign that we’d be able to find some excellent powder on the descent. Ty and Dylan dive off one of the Villager snow whales as fluffy powder explodes around them. At the Timberline Summit we took our time and enjoyed the weather, with the boys playing around in the snow near the summit station of the lift. Eventually E and I finished getting the gear readied, and with Dylan anxious to start skiing, we got on our way with the descent. 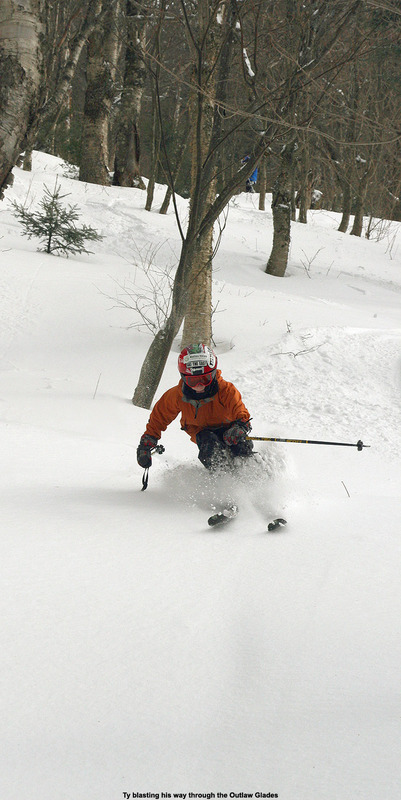 We headed down Brandywine and Intro to get access to the trails below the mid station, and the powder was indeed very good; consistent with what we’d seen on the way up Villager, there was roughly a half foot of classic Champlain Powder™. It wasn’t ultra light, so there was plenty of substance for a lot of floating, and even when you weren’t off the base, the subsurface was unblemished and reasonably soft such that even that skiing was great. There were some areas that had been hit by wind up high, but we able to find good powder on most pitches and knew that the effects of the wind would be even less below the mid station. I was going back and forth in my head about whether we should head for Twice as Nice, with its consistent pitch, or Spell Binder, with its lower traffic and steep headwall. The headwall isn’t always the best option if we haven’t had a dump large enough to provide floatation in the steeps, but with the quality of the subsurface we’d observed, I decided we’d give it a shot. It turned out to be a fantastic choice. I headed down first, keeping to the skier’s right for the best snow at the top, and then cutting back left as I got into the lower part of the headwall. Even with only midfat skis, speed got one floating, and the smooth, undisturbed nature of the subsurface with the quality fluff on top made for an impressive ride. I pulled up a good distance below the headwall, and got out the Canon to catch the descents of the others. 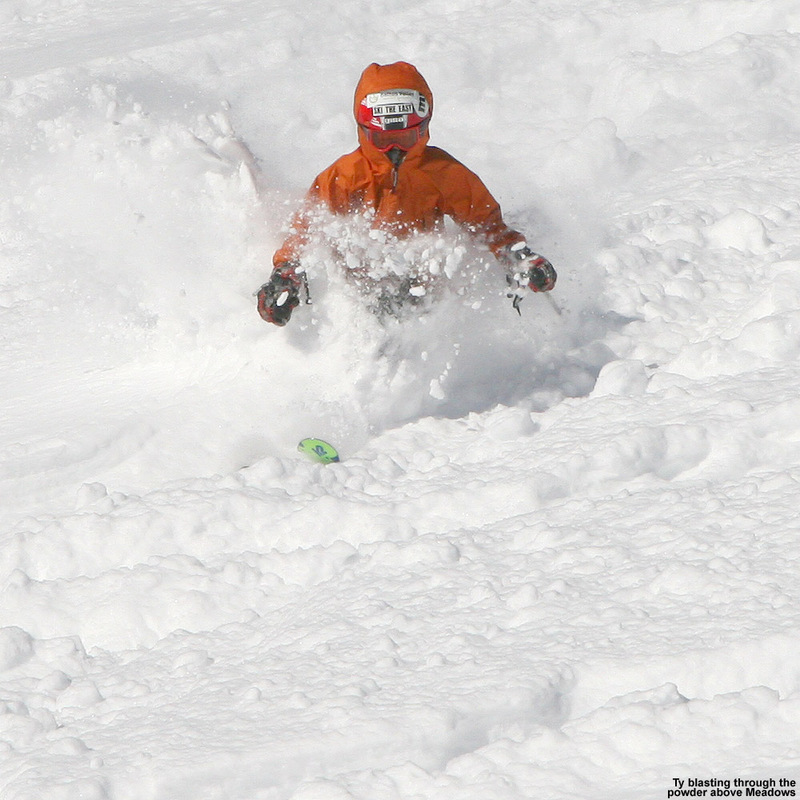 The boys went first and were looking extremely good, carving some big, high-speed turns down the headwall. In anticipation of the powder, we’d brought their fat skis, so with their light body weight, the girth of their skis, and the high speeds, they had no problem floating. Seeing Dylan with the confidence to arc down the slope at high speed was especially exciting, and it’s obvious the strides he’s making in his skiing this season; sifting through today’s action shots and observing his form really bore that out. Dylan slices a huge high-speed arc through the powder on the Spell Binder headwall. Once below the headwall we all enjoyed a long run of powder cruising, gliding our way through the fluff that was most protected from the wind. The dips and berms of the water bars were still occasionally visible, but fortunately the snowpack is well past the stage where they’re of much concern. 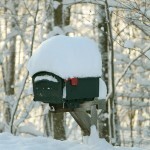 We did another couple rounds of photography, taking advantage of the great light and excellent snow. The depth of the powder did decrease with elevation, but there were a few inches present even down to the 1,500’ level to make for quite a complete run. If we’d had the time and the boys had had the inclination, it would have been fun to run some additional laps on the terrain, but the day was wearing on and since the Patriots were playing, we were thinking of watching some of the Super Bowl. Stephen also had to pick up Johannes and Helena from their lessons… and let them know what they’d missed of course. E enjoys the expanse of powder available on Spell Binder today. We dropped Stephen off at the Village Circle and headed back to our car to complete the circuit. 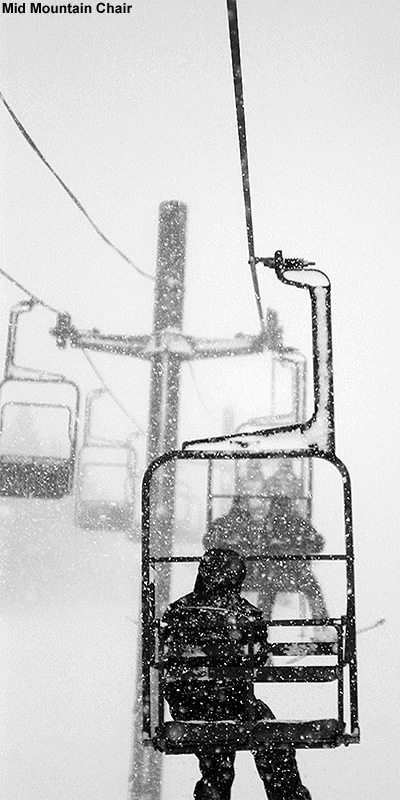 We definitely need to get in more of these days, although I suspect Timberline will be opening soon. There’s always spring though when the mountain shuts Timberline back down. The weather pattern appears to be changing, and it looks like we’ll be trading in all the mixed events for something different. 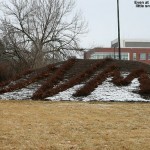 Hopefully we can keep the precipitation coming in the form of snow. E and I started up a two-day chili recipe yesterday, and the final stage was when it cooked in the crock pot today, so it was ready when we got home. It was very good… very good – my only regret was that I had to take it easy due to what my stomach had been dealing with earlier. Fortunately it stores very well!